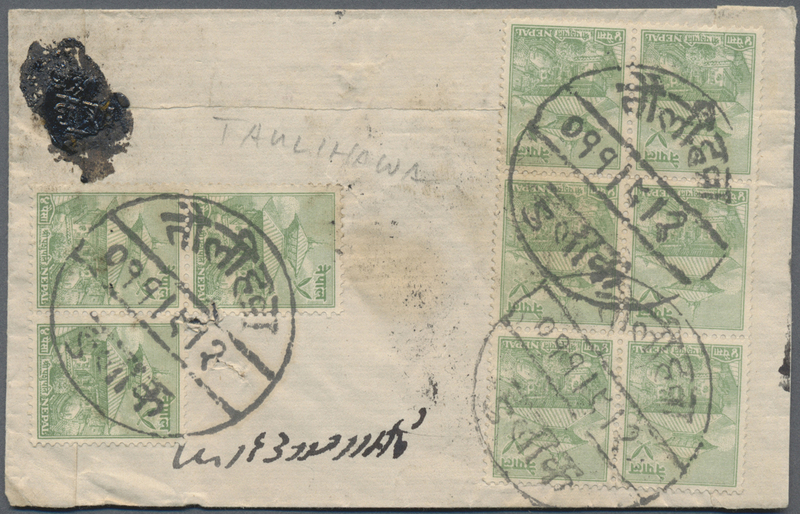 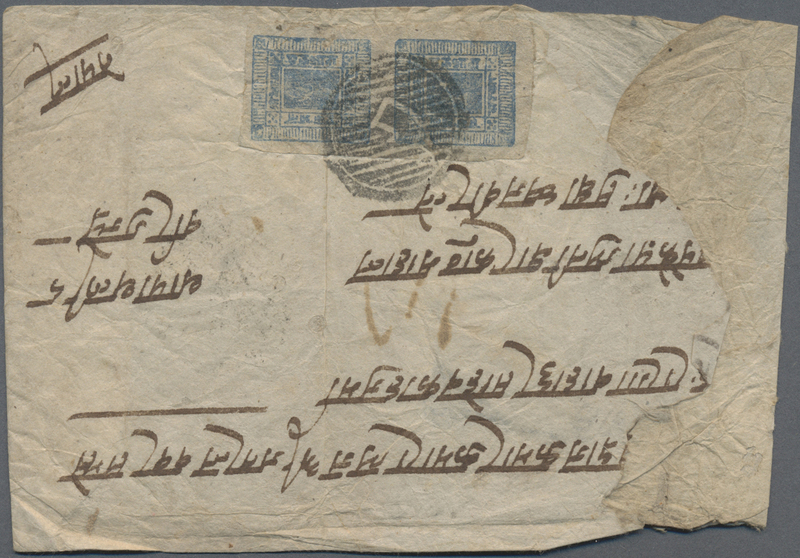 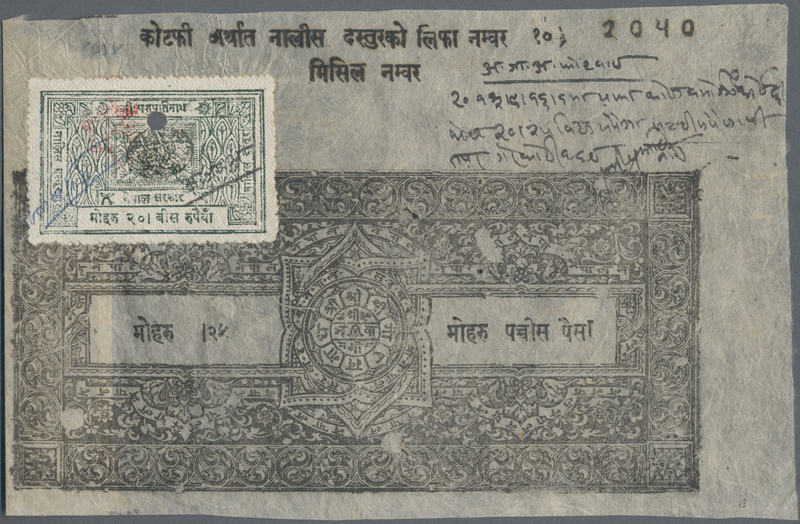 31018 Ganzsache (Complete) 1887-1950's: Collection of about 100 covers franked by stamps of 1907-41 Pashupati issues, several in combination with 1949 'Landscape' or 1958 Air, plus 11 postal stationery cards and envelopes, with six unused 'Horse' cards (various types) and five used envelope (various issues) mostly as registered mail uprated by Pahupati stamps, plus more than 60 stampless covers, with a lot of different native postmarks and seals, and other interesting details. 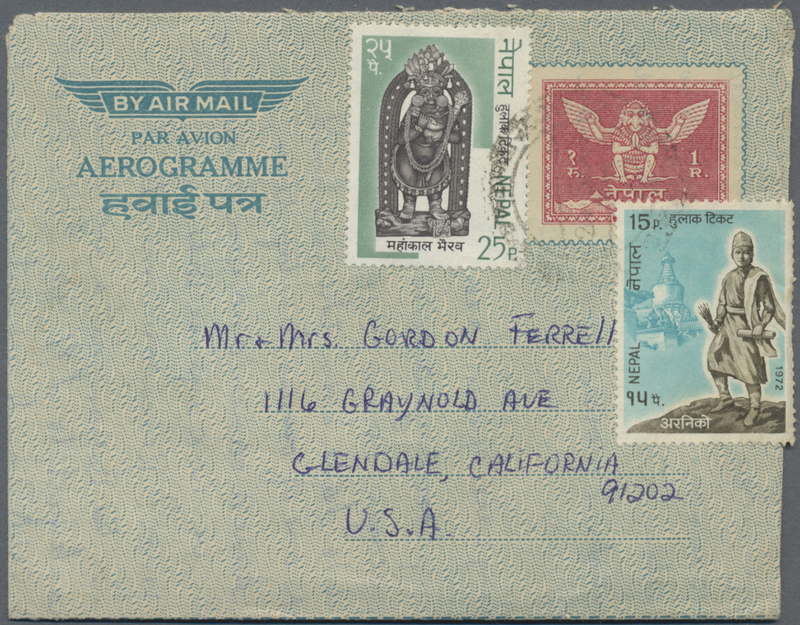 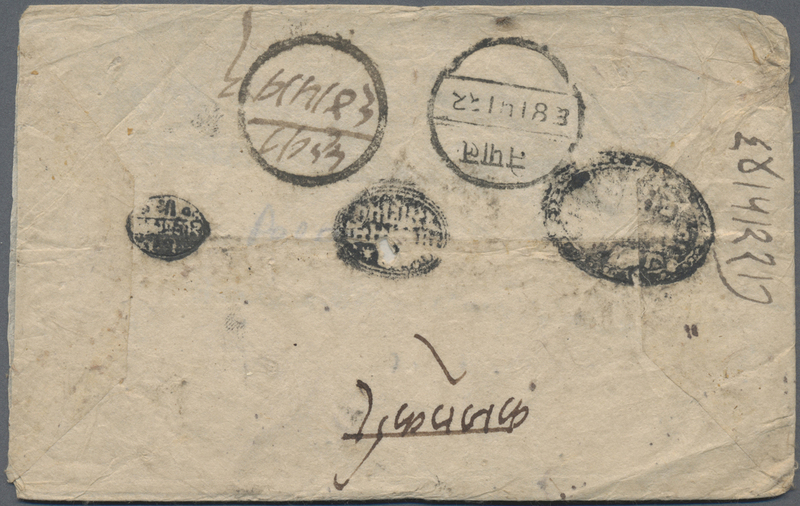 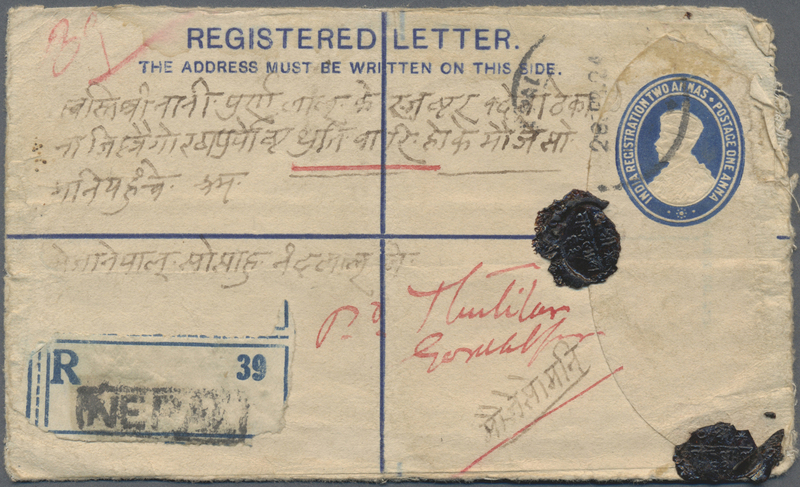 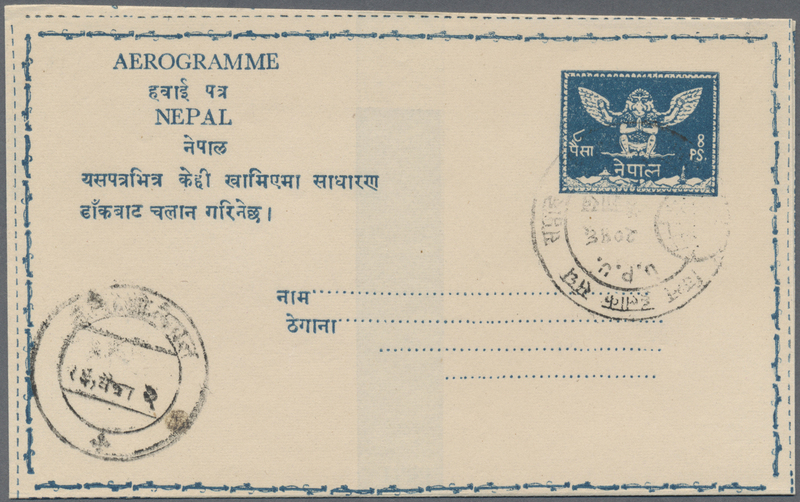 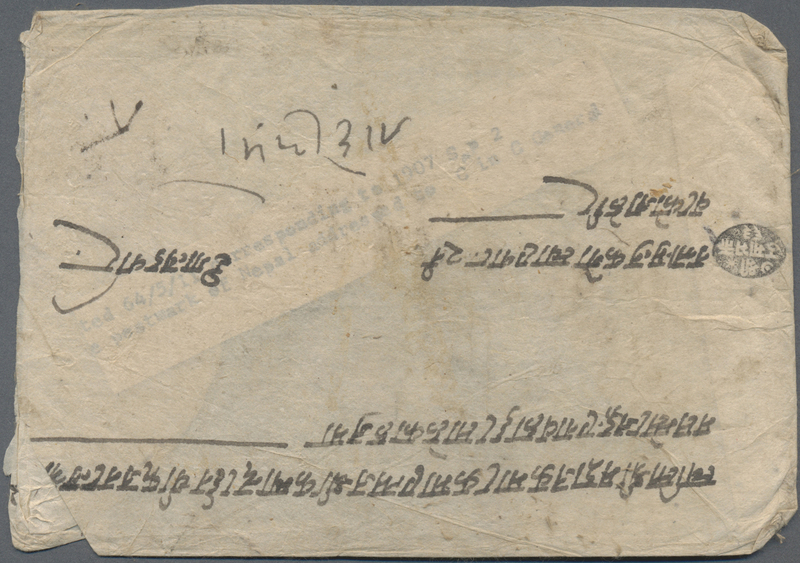 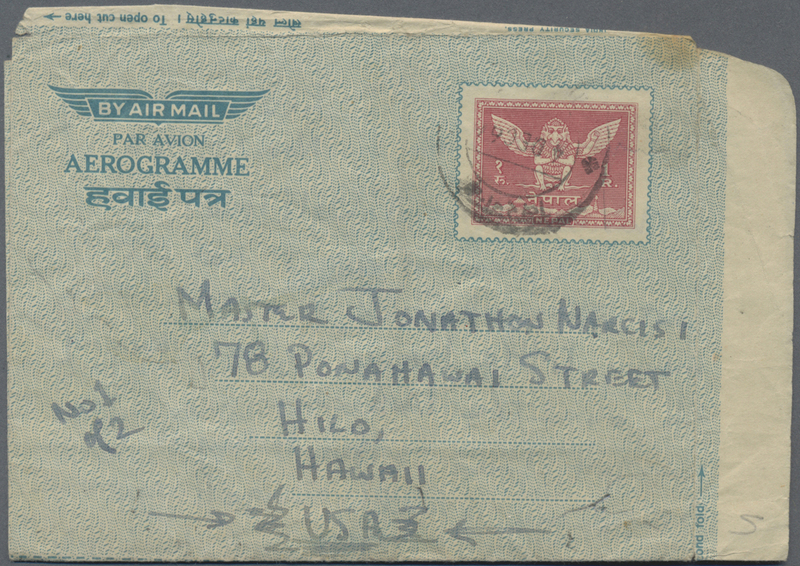 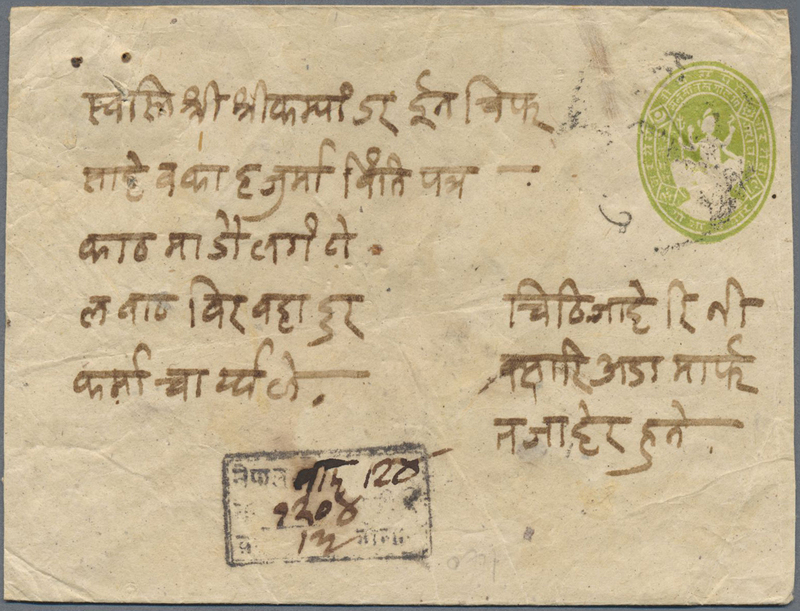 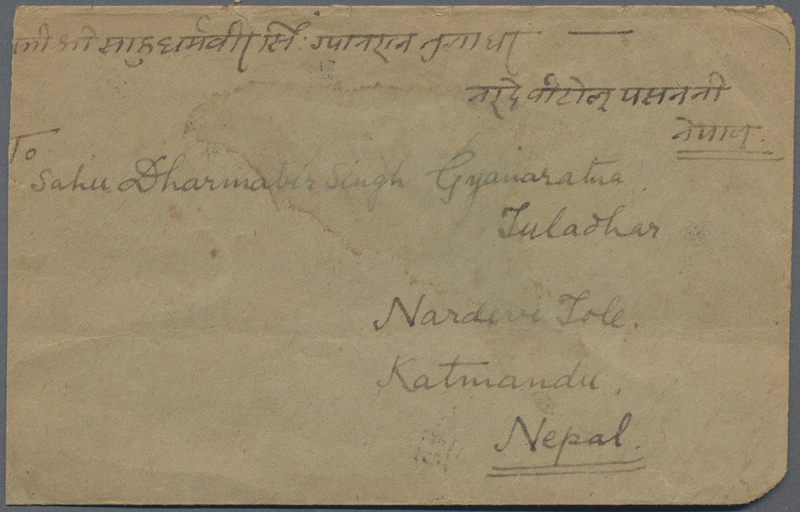 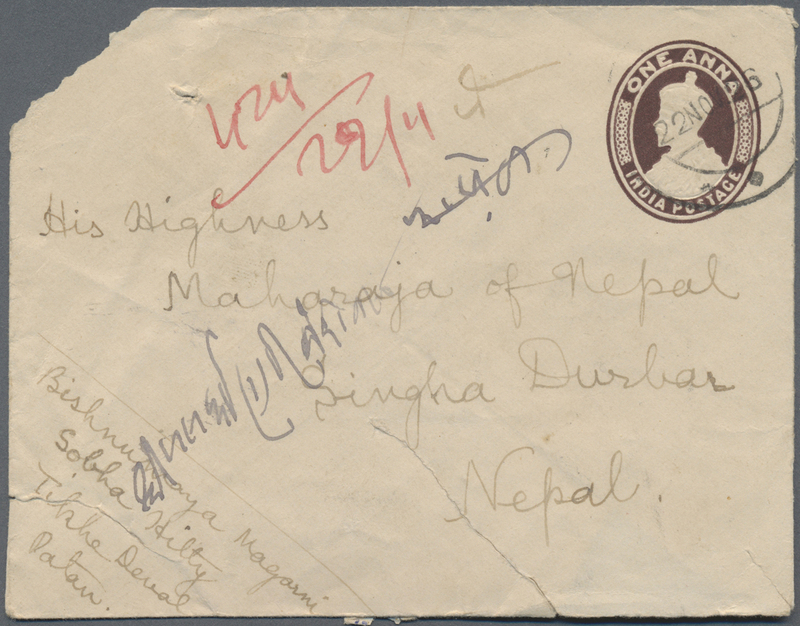 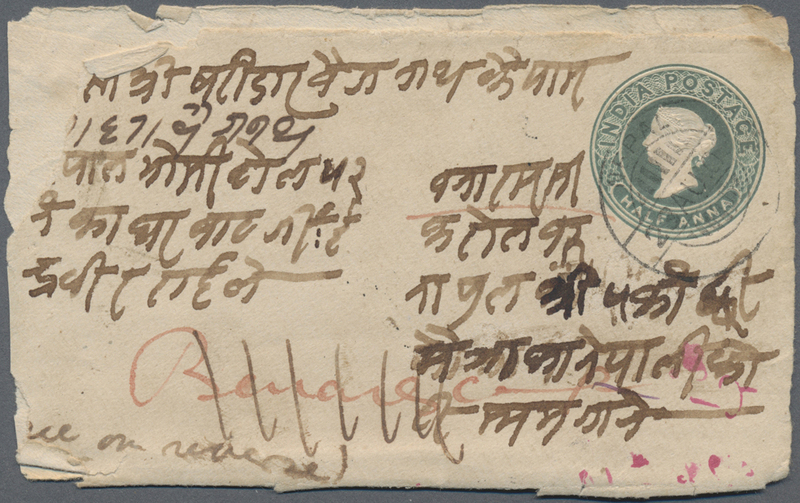 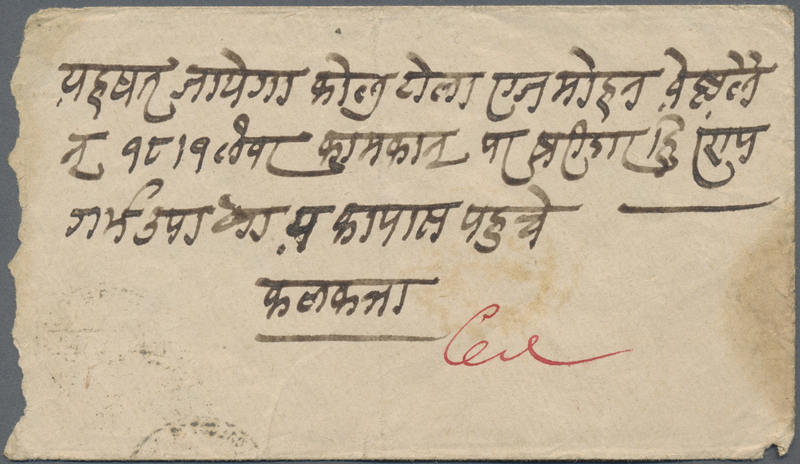 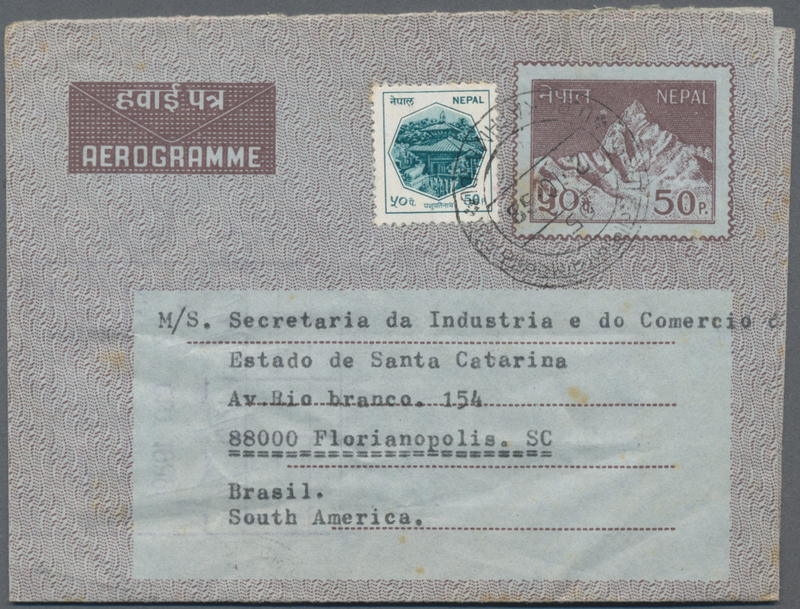 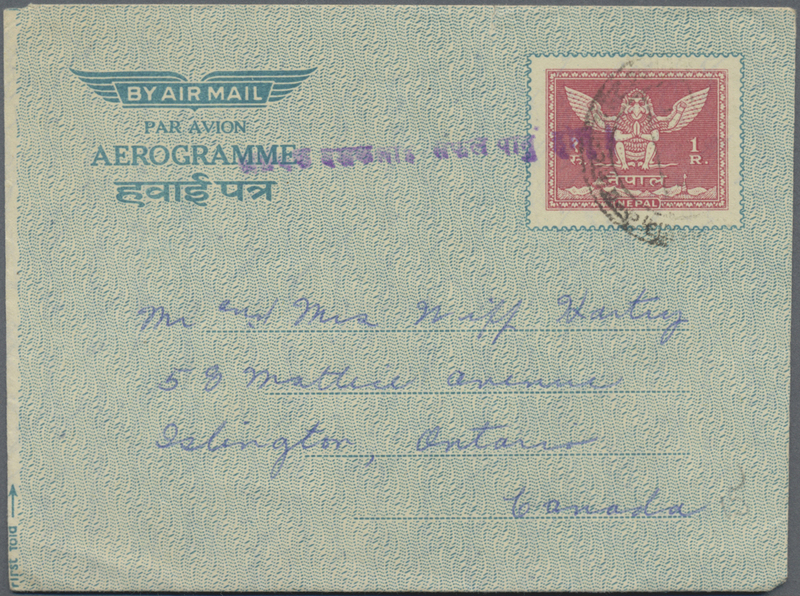 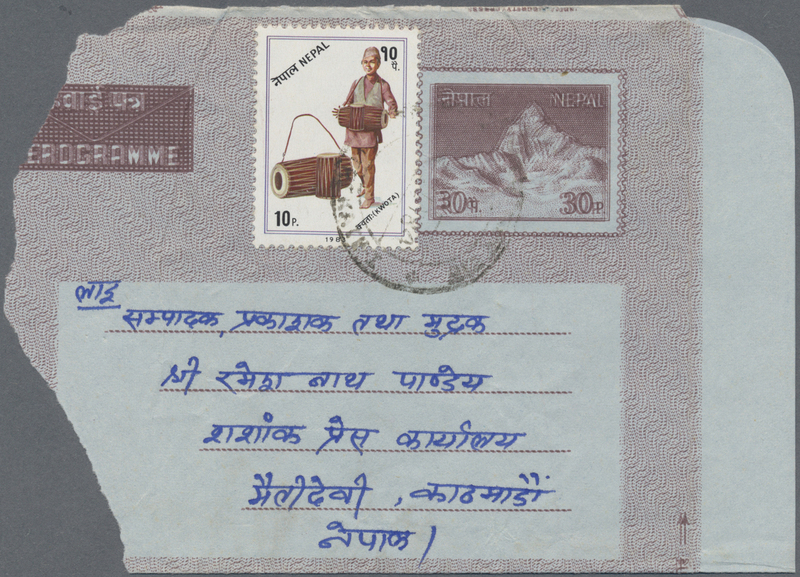 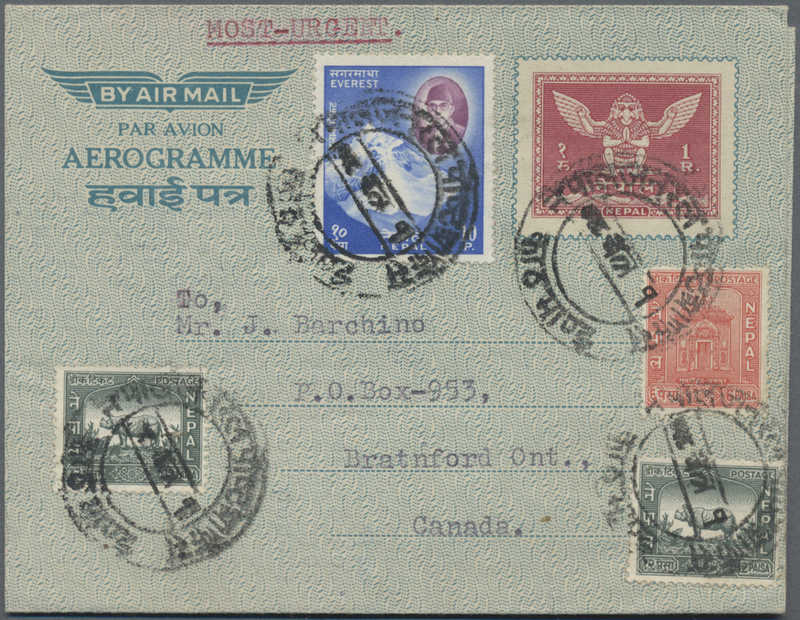 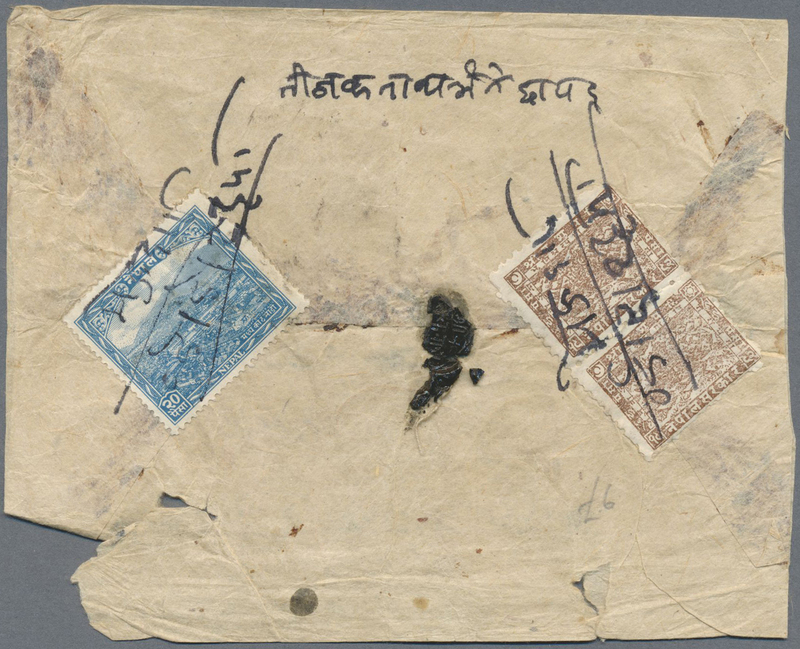 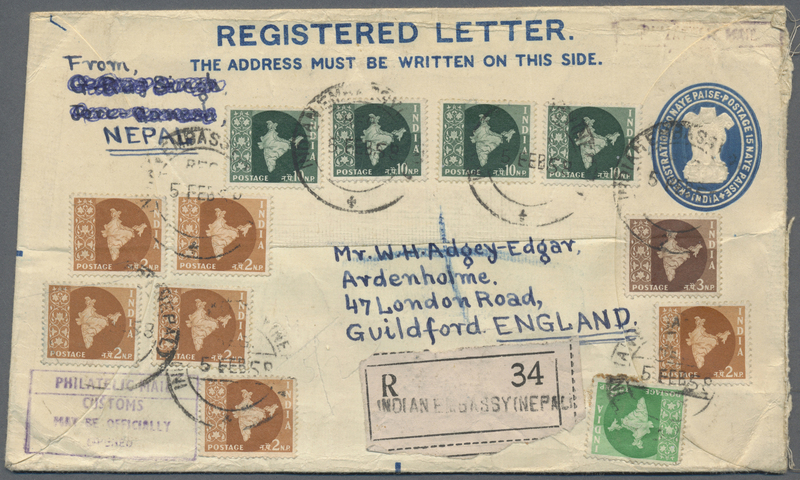 31020 Ganzsache (Complete) Brief (cover) 1940's-50's: Collection of 20 postal stationery registered envelopes and covers from NEPAL to England, plus one native cover, with several covers from the British Legation Nepal with British Indian adhesives, and others from the Indian Embassy Nepal after 1947, mostly registered and from one correspondence, in slightly mixed condition. 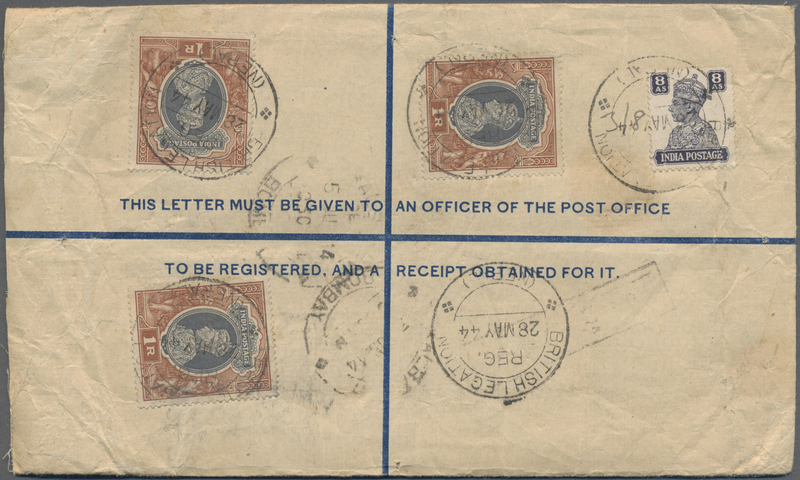 31025 ungebraucht (hinged) * postfrisch (never hinged) ** gestempelt (marked) 1911/1957, mainly mint collection of apprx. 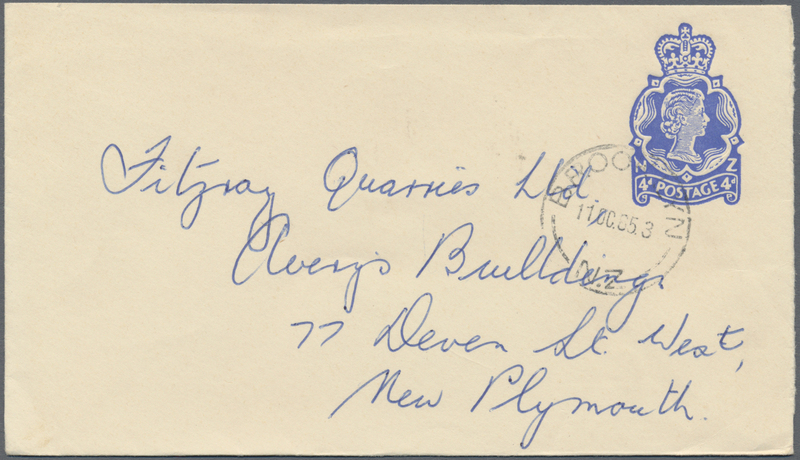 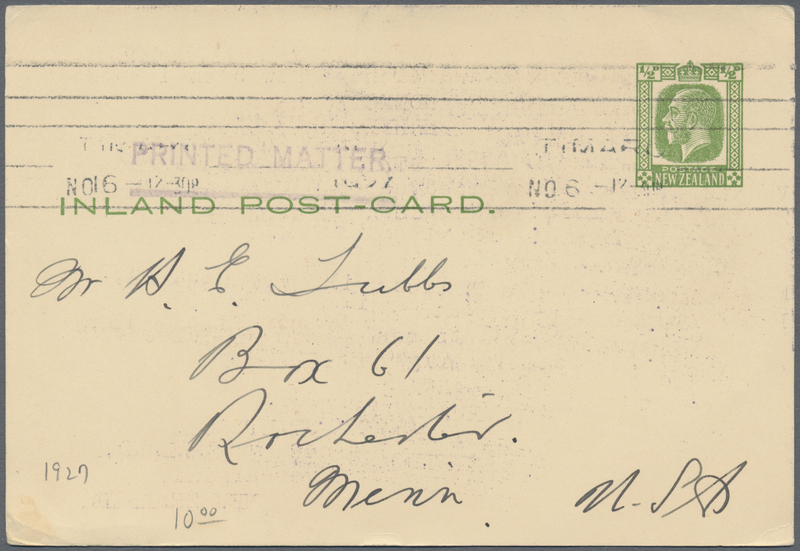 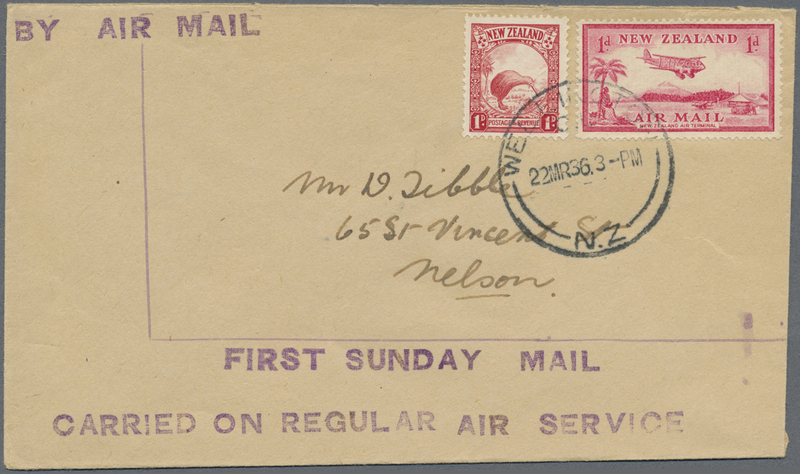 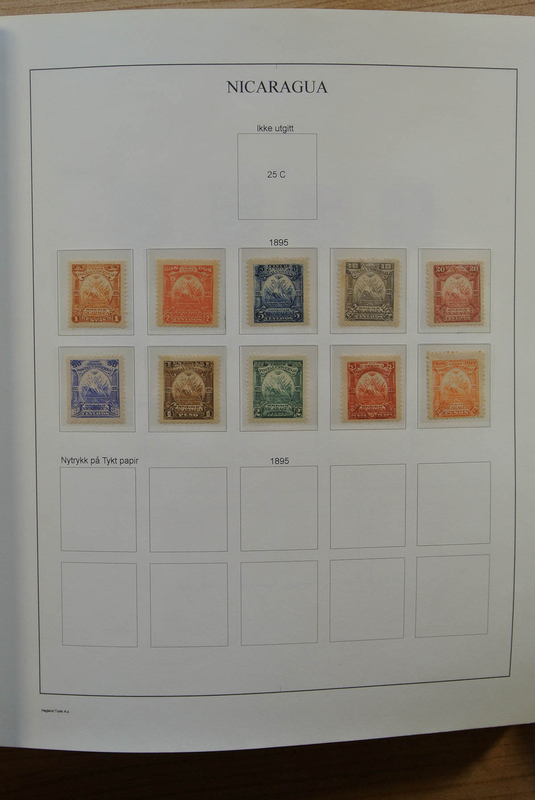 96 stamps on stockpages incl. 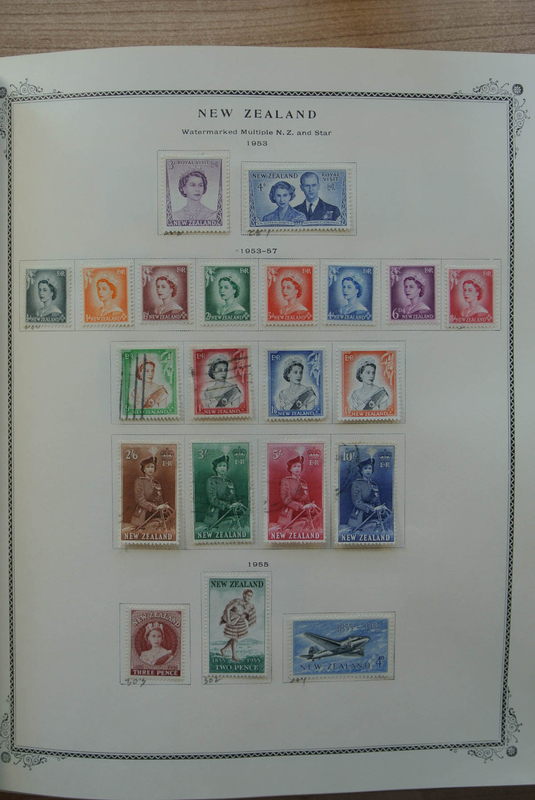 1938 British issue Gold currency, 1941 France libre overprints and a good section postage dues. 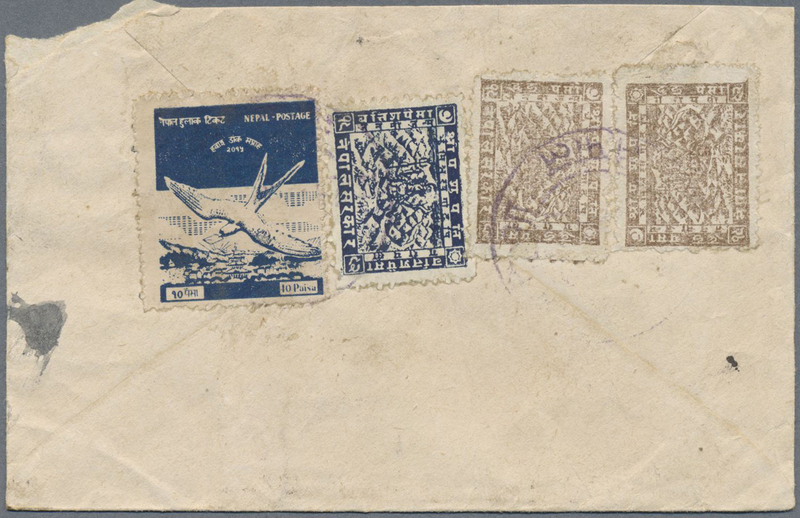 31032 postfrisch (never hinged) ** 1946, "DU CHAD A RHIN" IMPERFORATE, five complete sets, unmounted mint (three sets with gum toning). 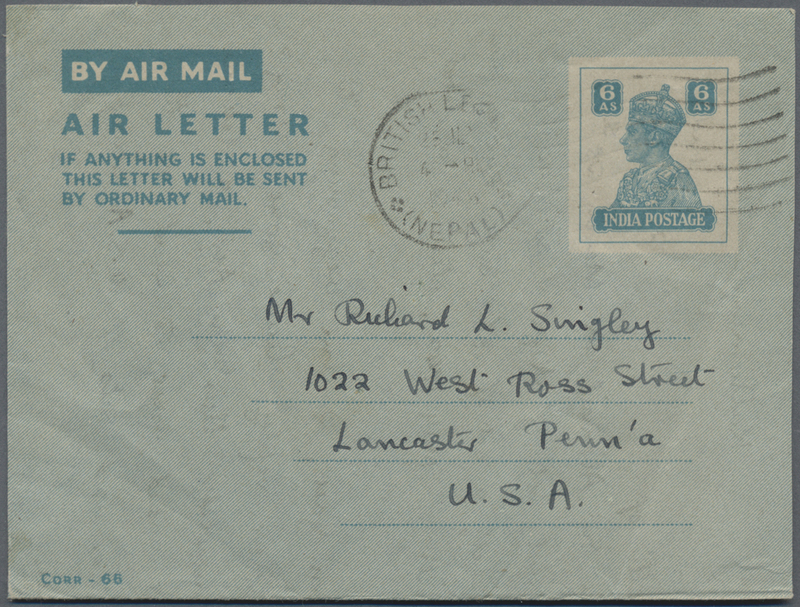 Maury PA55/60 nd (5), 625,- €. 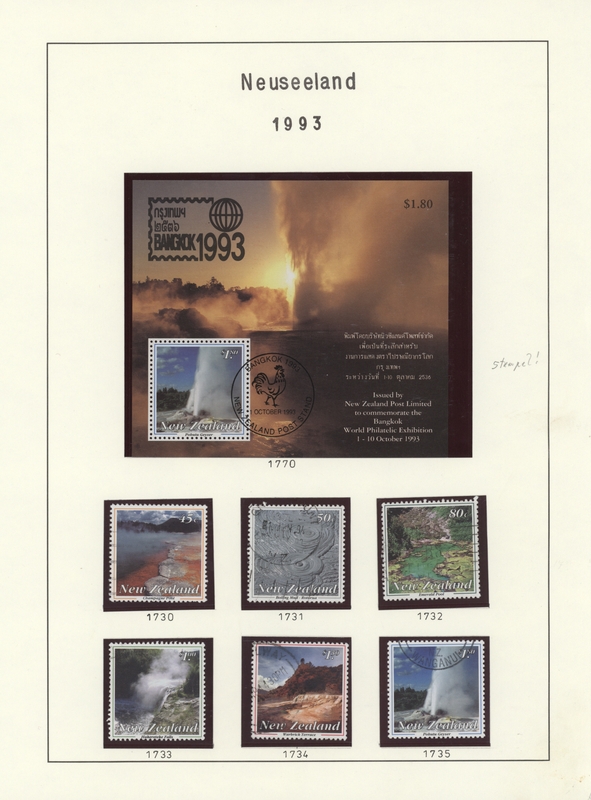 31033 postfrisch (never hinged) ** 1983, 25th Anniversary of PTT, lot of 41 IMPERFORATE se-tenant sheets (of five strips of three), unmounted mint. 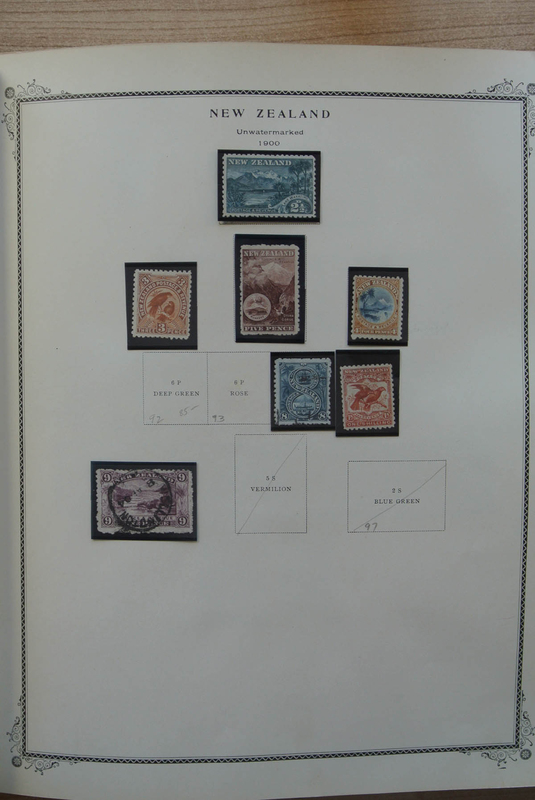 Maury 478A nd, 5.125,- €. 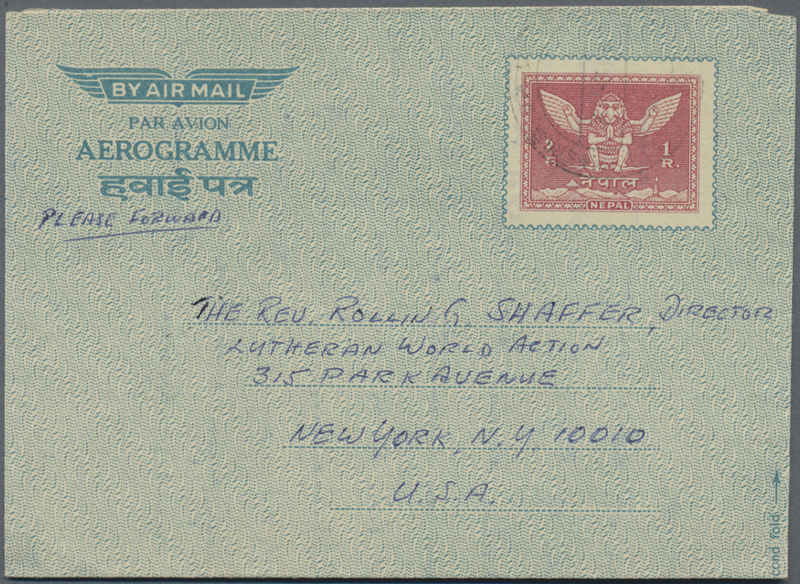 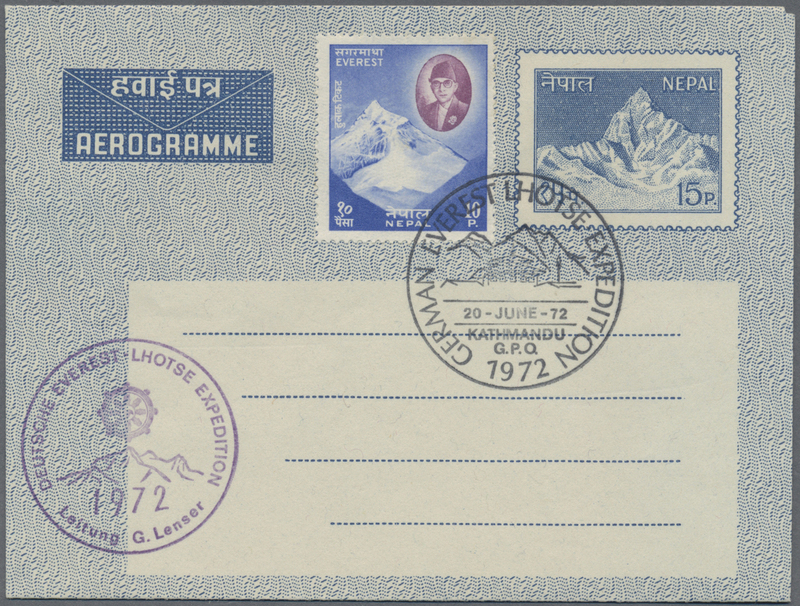 31034 postfrisch (never hinged) ** 1983, World Communication Year, 170fr. 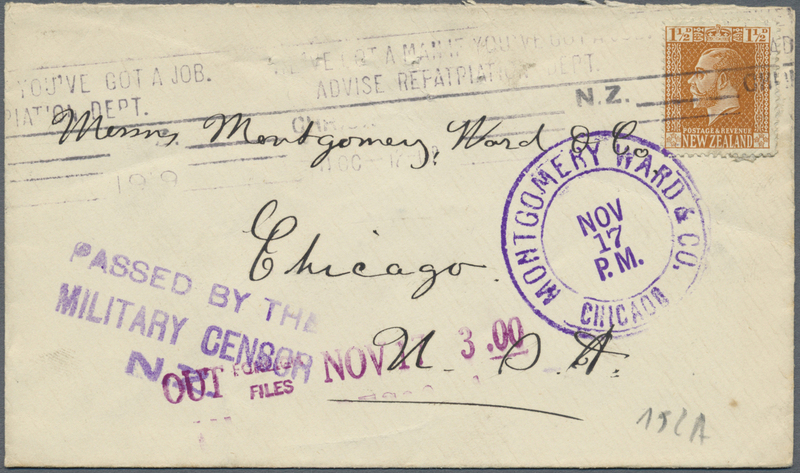 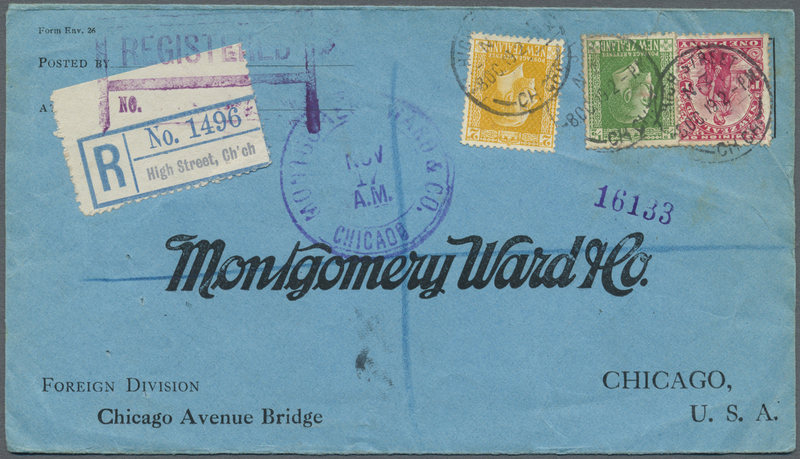 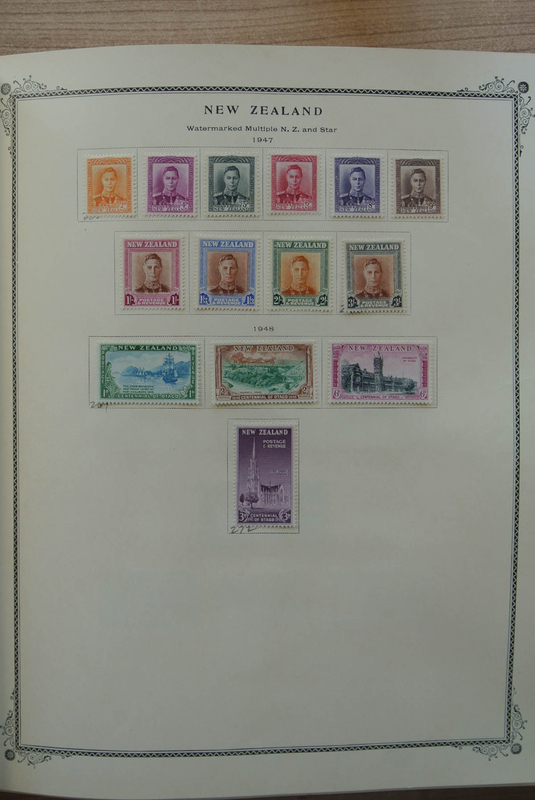 IMPERFORATE, 285 copies unmounted mint. 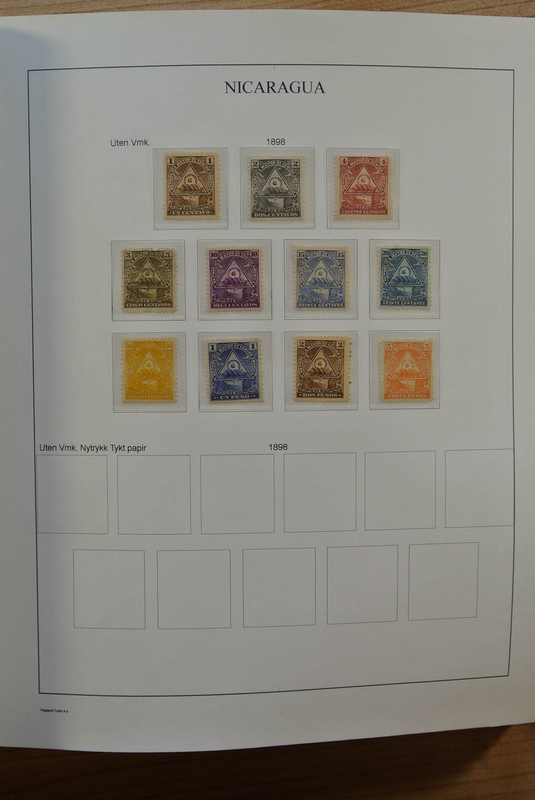 Maury PA231, 7.125,- €. 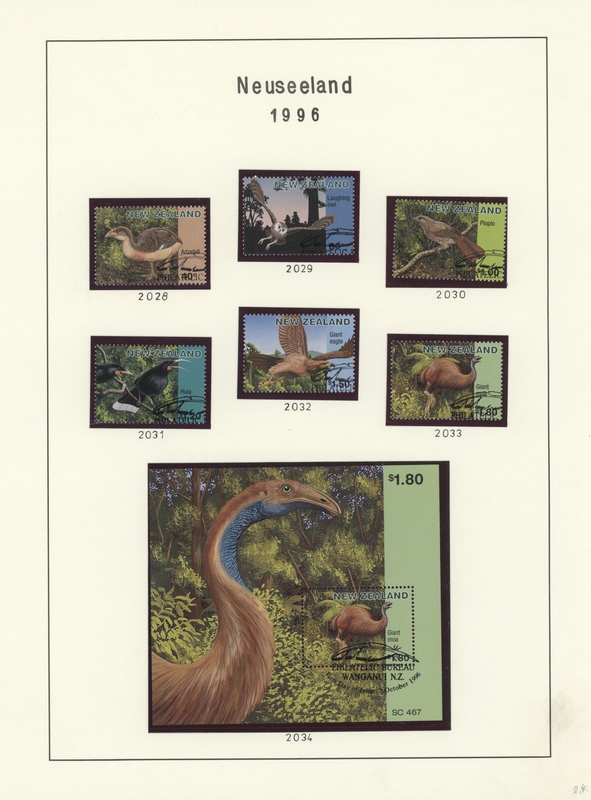 31035 postfrisch (never hinged) ** 1985, Local Birds, 50fr. 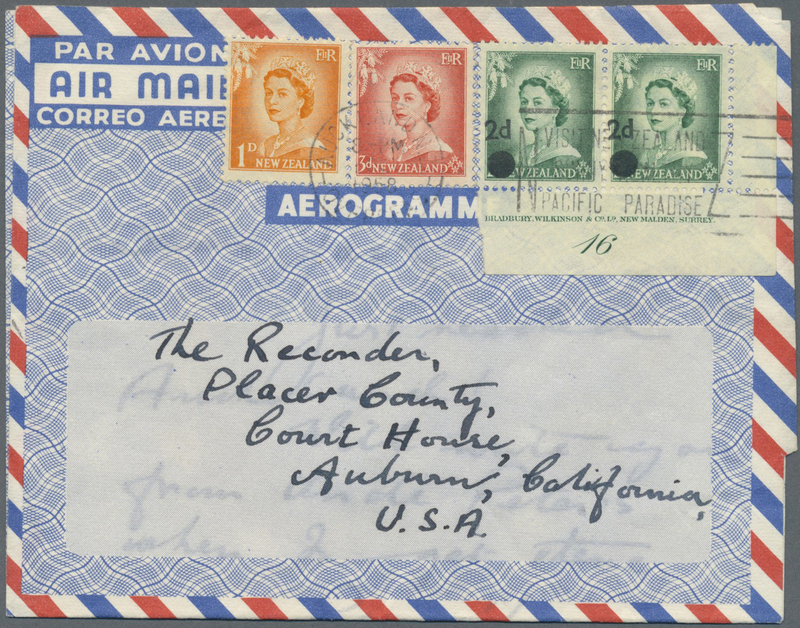 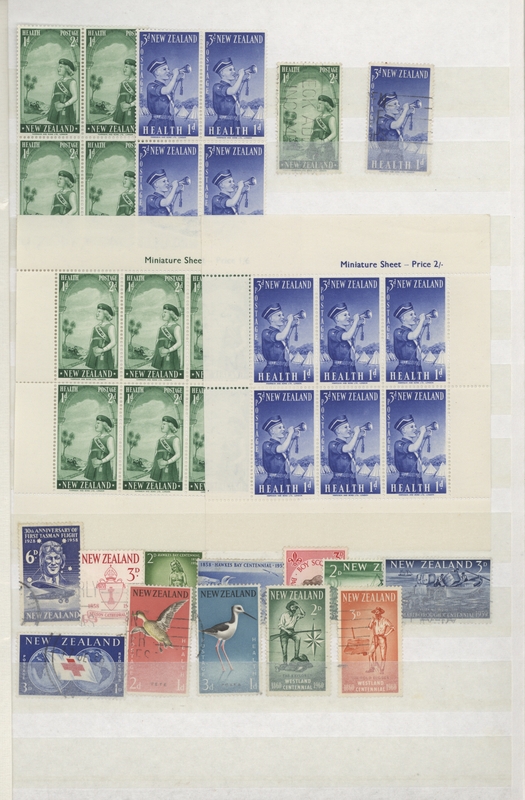 and 60fr., 240 IMPERFORATE sets, unmounted mint. 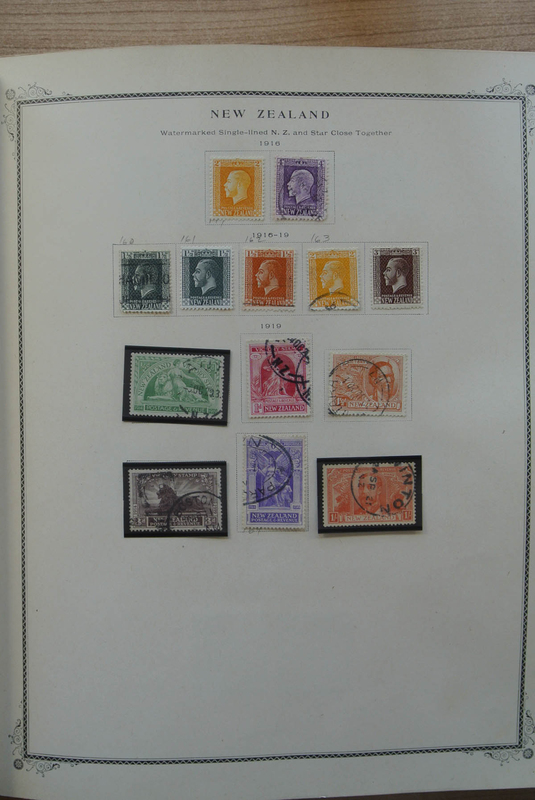 Maury 517/18 nd, 4.800,- €. 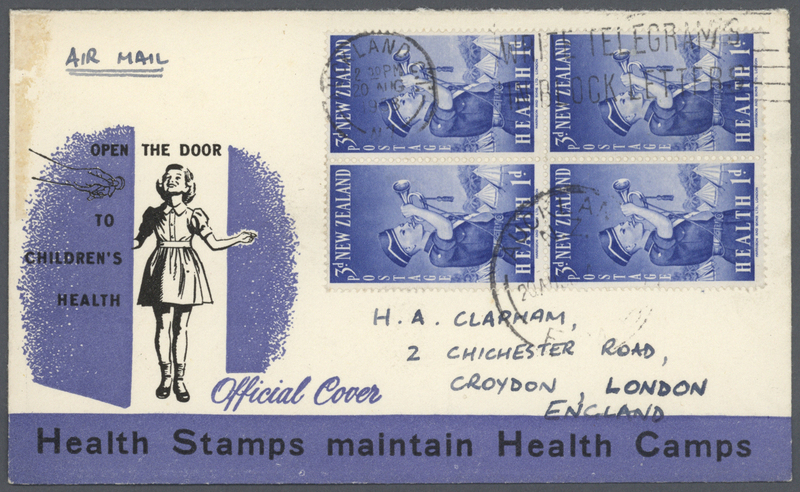 31036 postfrisch (never hinged) ** 1986, 120th Anniversary of Pharmacies on New Caledonia, 80fr. 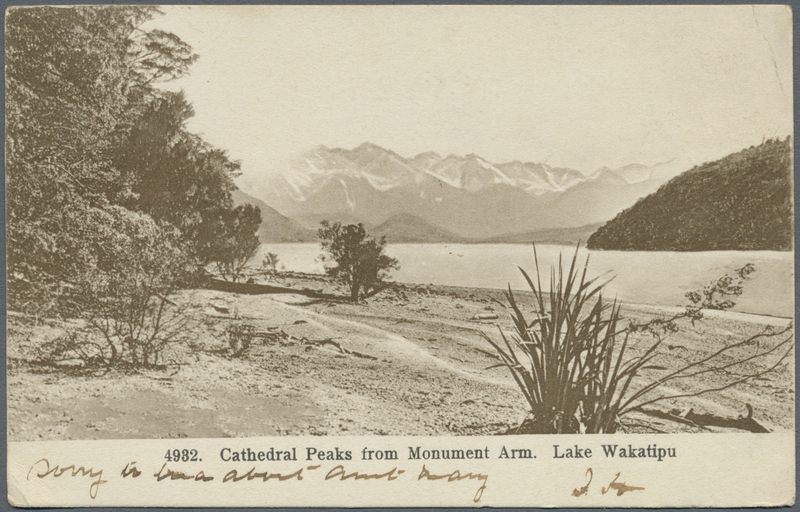 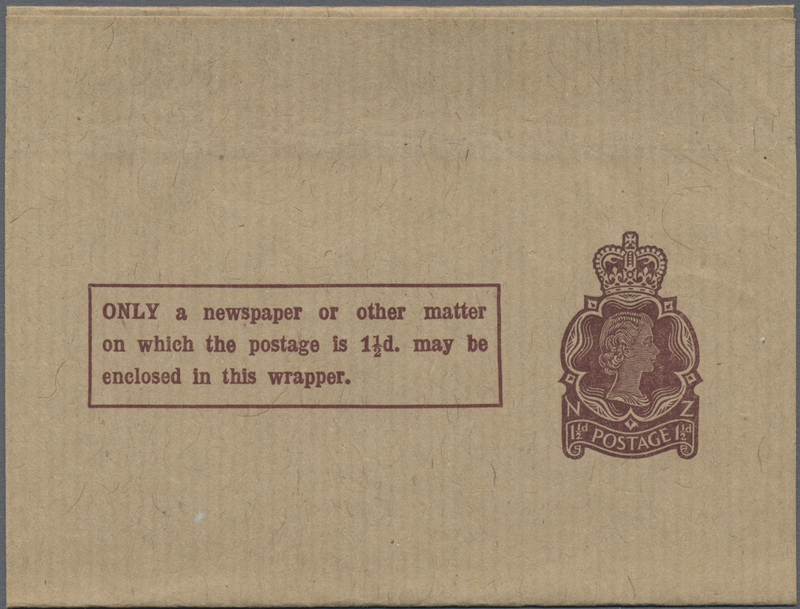 IMPERFORATE, 240 copies unmounted mint. 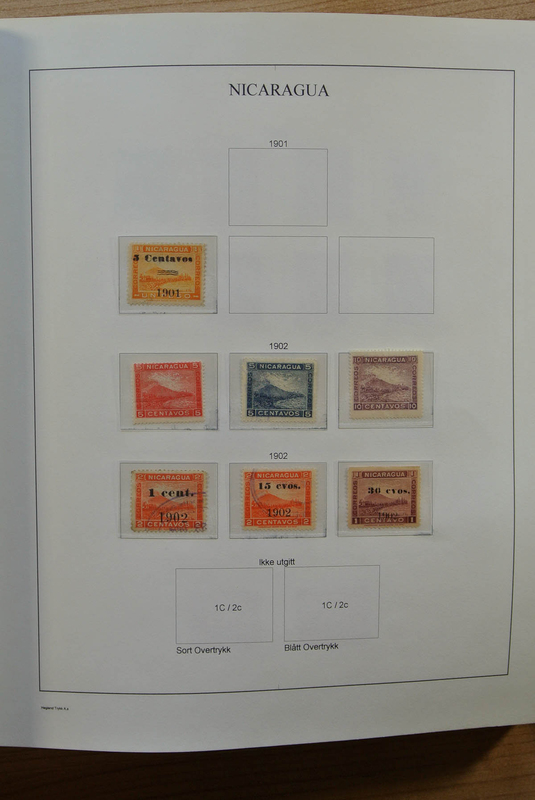 Maury 526 nd, 3.600,- €. 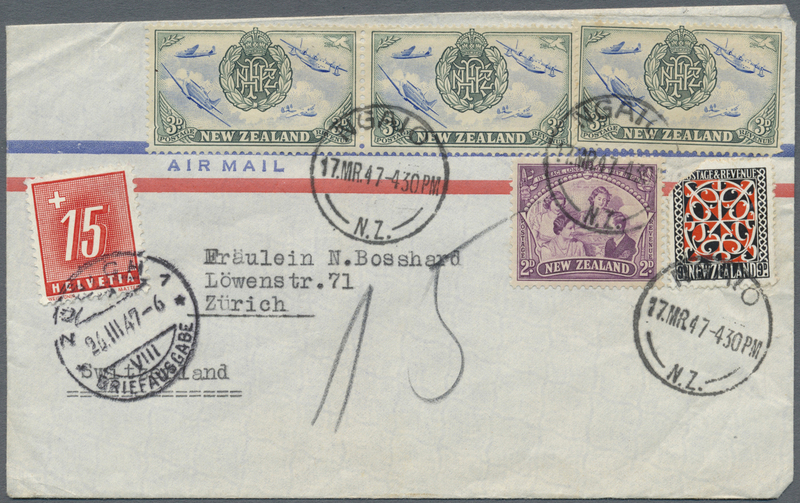 31037 postfrisch (never hinged) ** 1986, Airmails, 72fr. 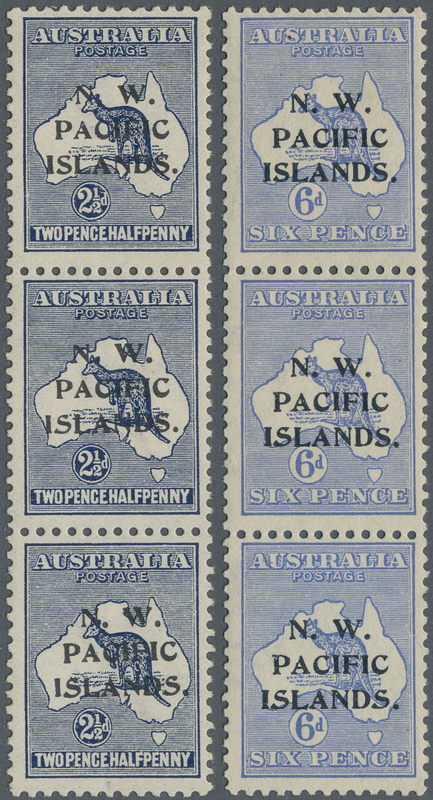 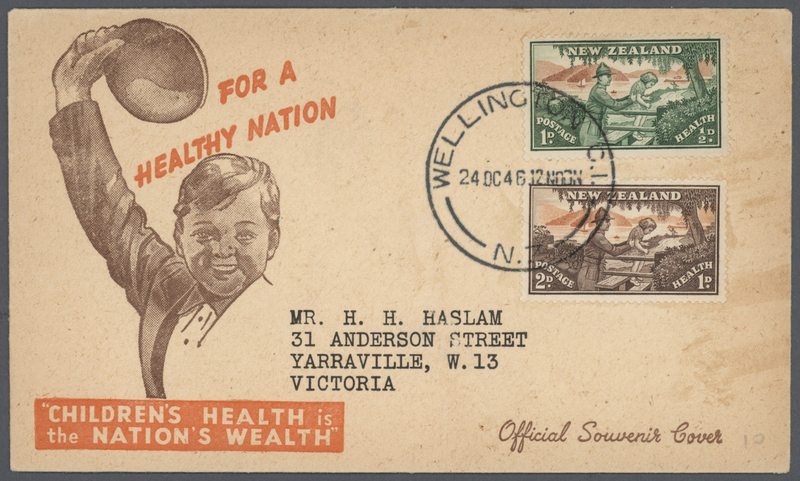 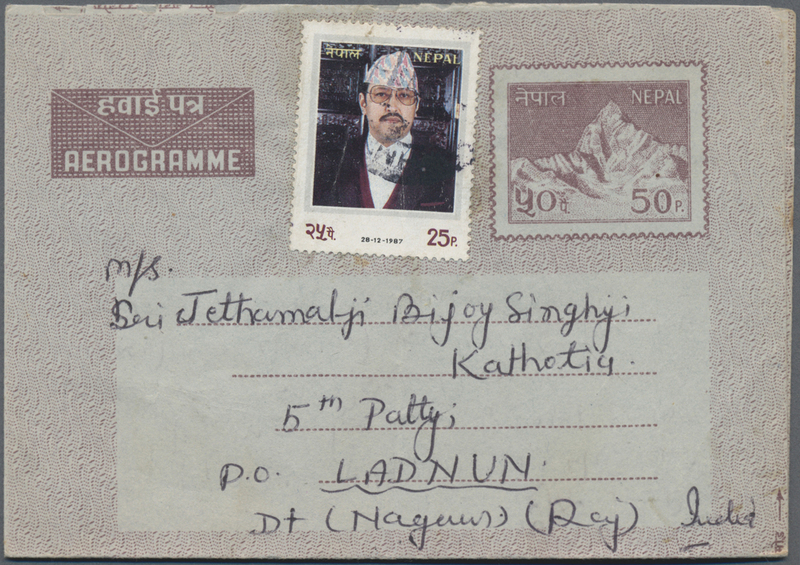 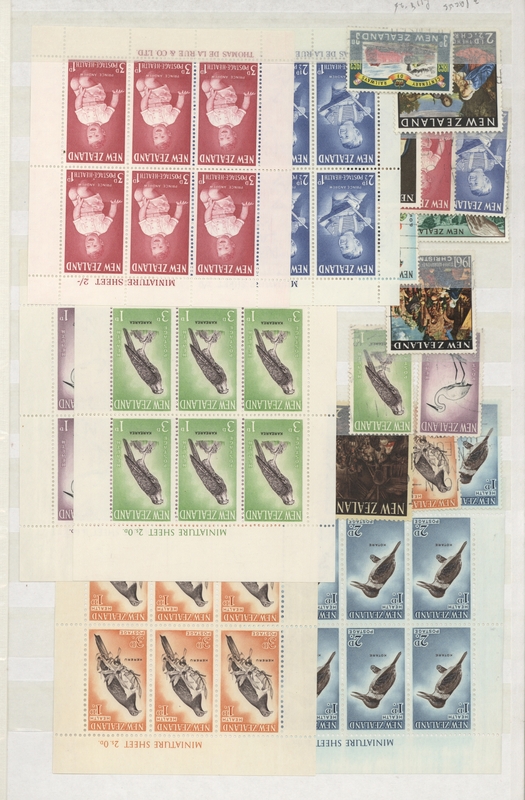 IMPERFORATE, 255 copies unmounted mint. 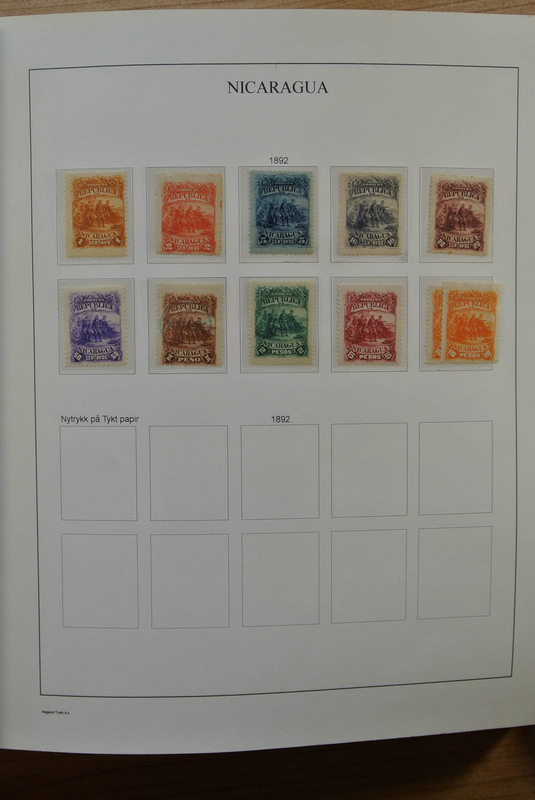 Maury PA253 nd, 2.550,- €. 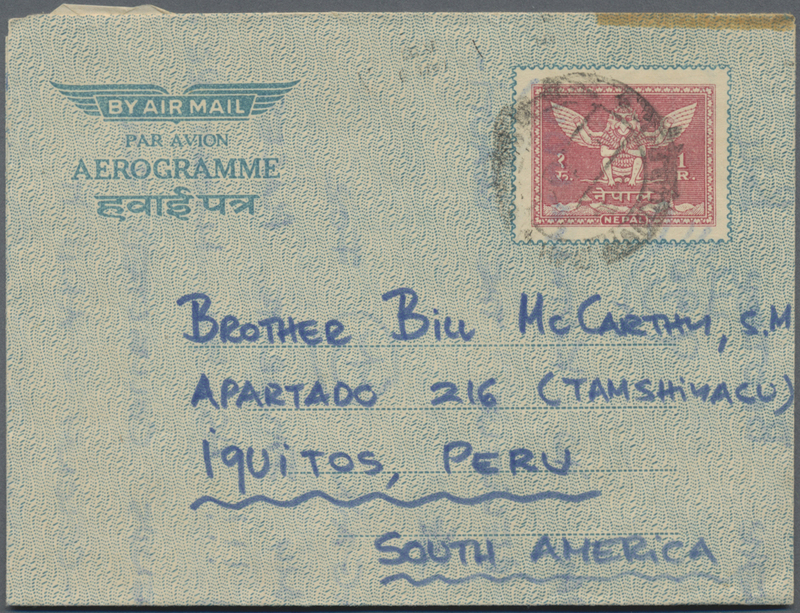 31038 postfrisch (never hinged) ** 1986, Football World Championship Mexico, 60fr. 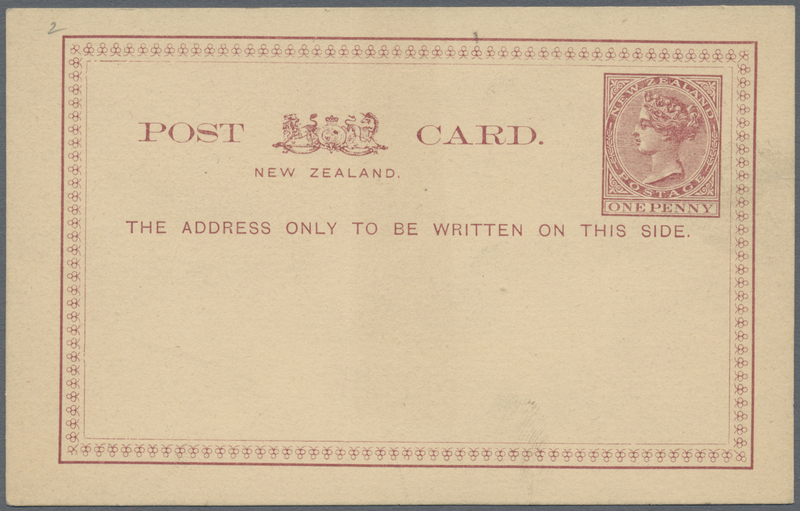 IMPERFORATE, 240 copies unmounted mint. 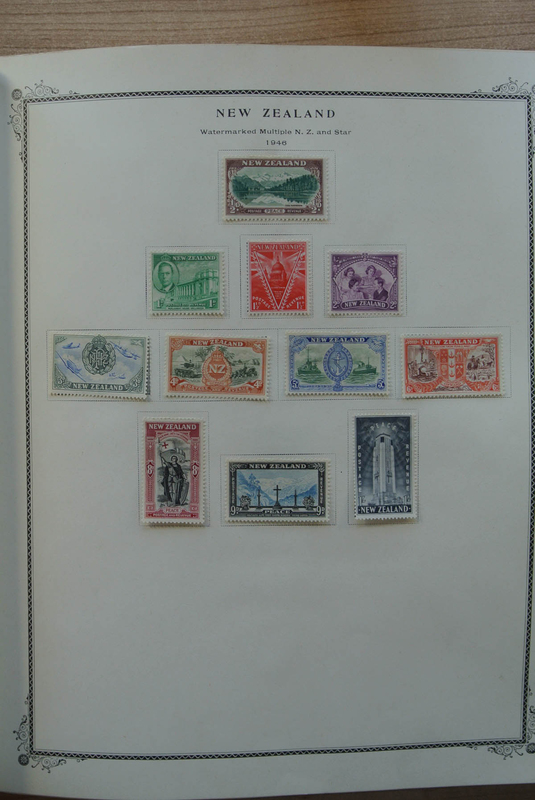 Maury 525 nd, 4.800,- €. 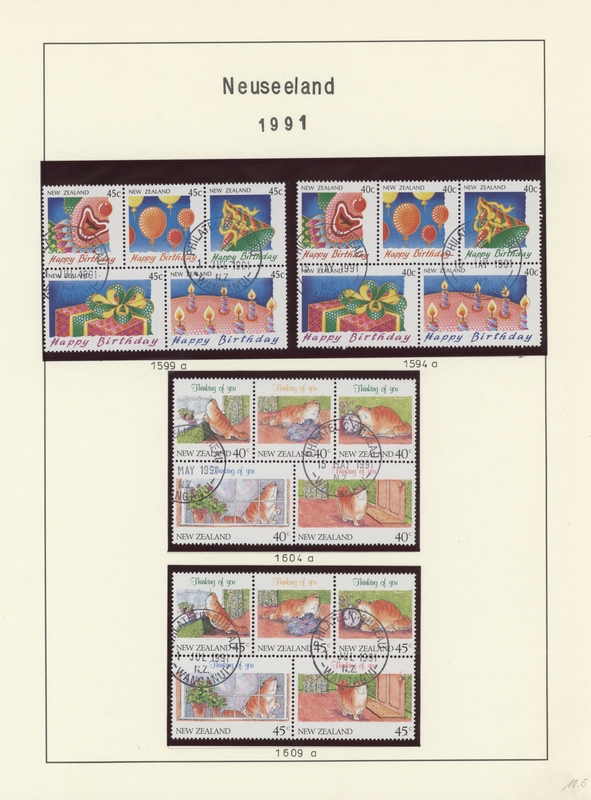 31039 postfrisch (never hinged) ** 1986, Geckos, 20fr. 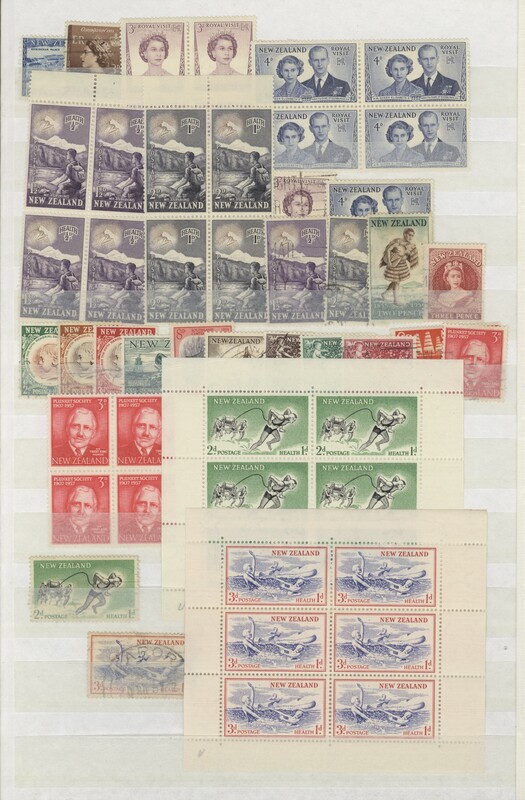 and 45fr., 240 IMPERFORATE sets unmounted mint. 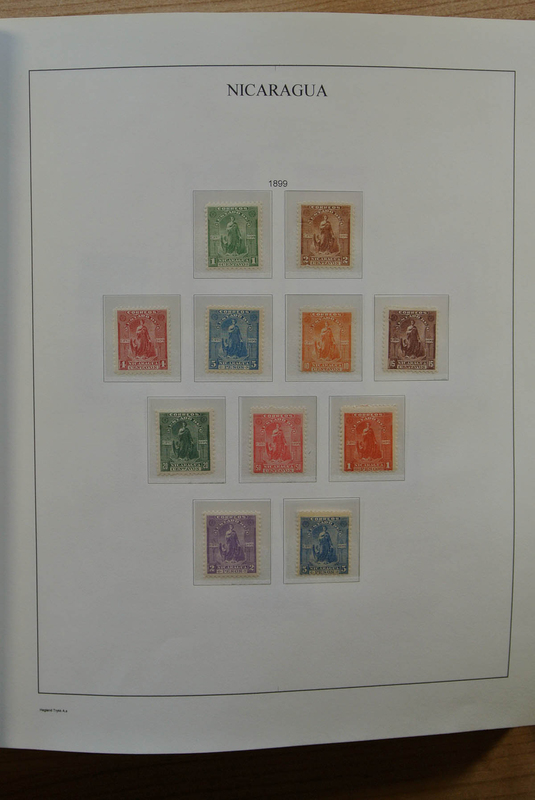 Maury 523/24 nd, 4.800,- €. 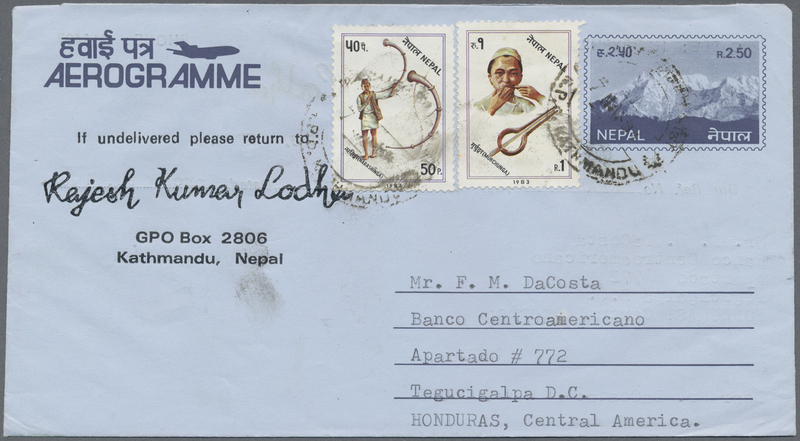 31040 postfrisch (never hinged) ** 1986, Marine Life, 10fr. 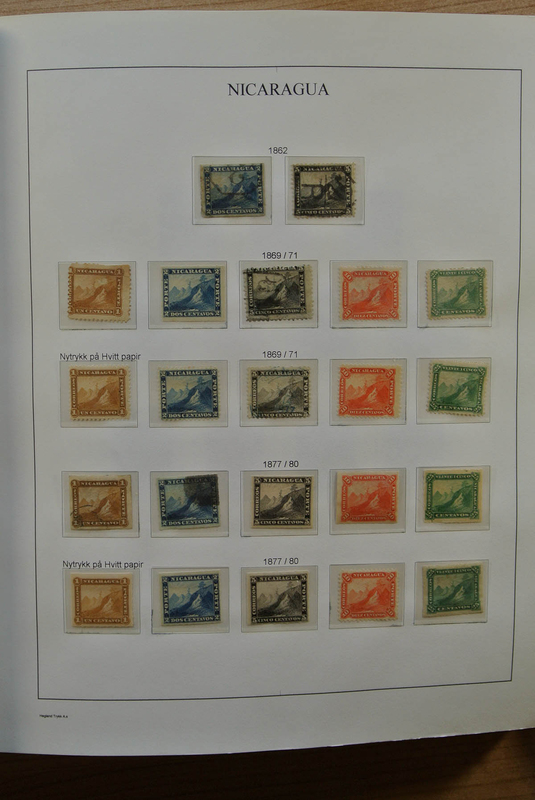 and 17fr., 245 IMPERFORATE sets unmounted mint. 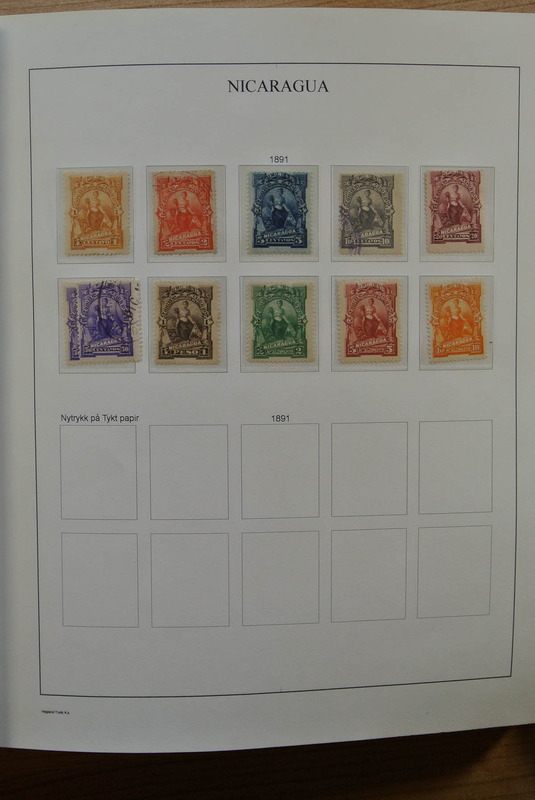 Maury 51/20 nd, 4.900,- €. 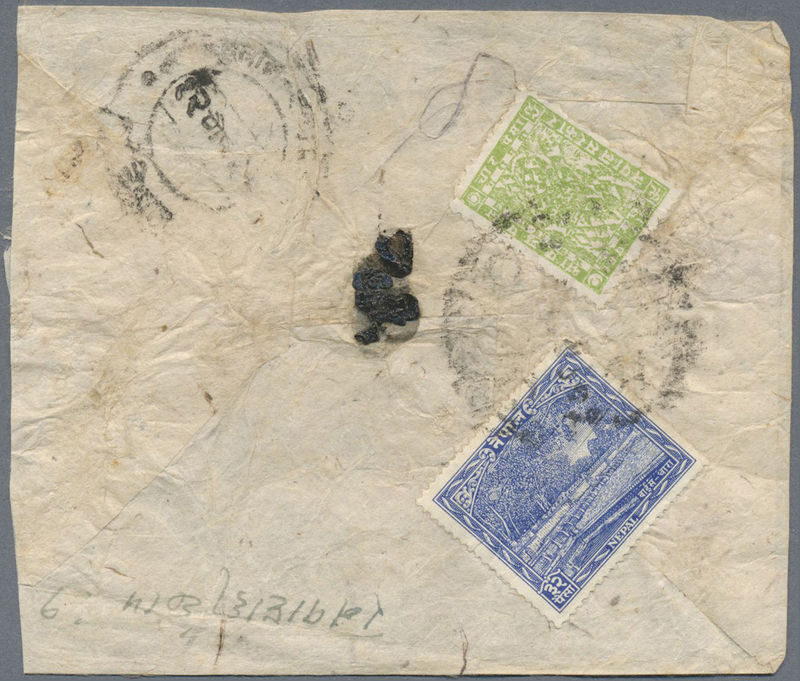 31044 postfrisch (never hinged) ** ungebraucht (hinged) * 1862-1990 ca. 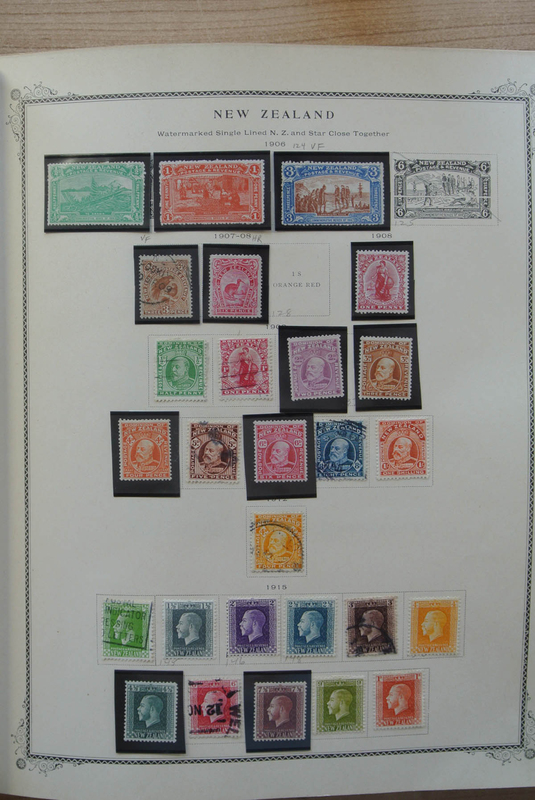 : Mint collection on Stanley Gibbons pages, largely complete, just missing some high values and rarities for completion, but with many scarce items from early Queen Victoria issues as well as varieties and other areas such as Officials, Postage Dues, Postal Fiscals, Life Insurance Dept., Railways Newspaper stamps, Pigeon stamps etc., plus issues of Ross Dependencies. 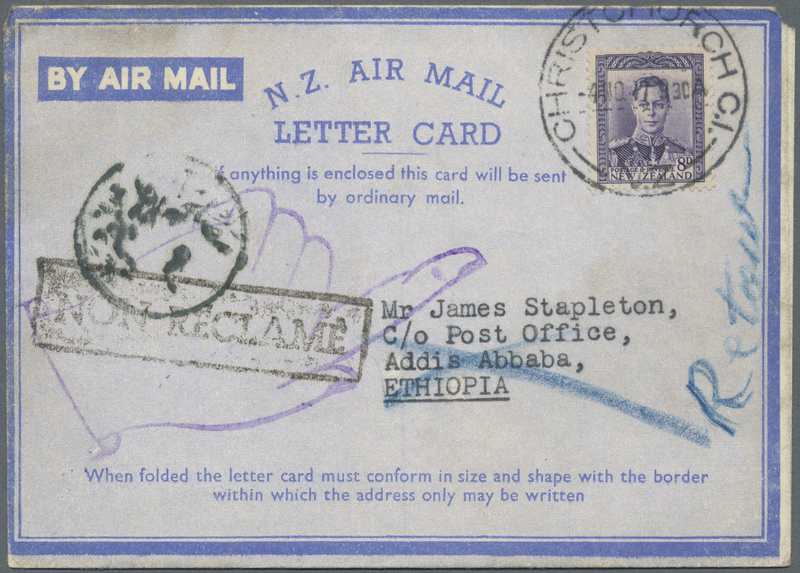 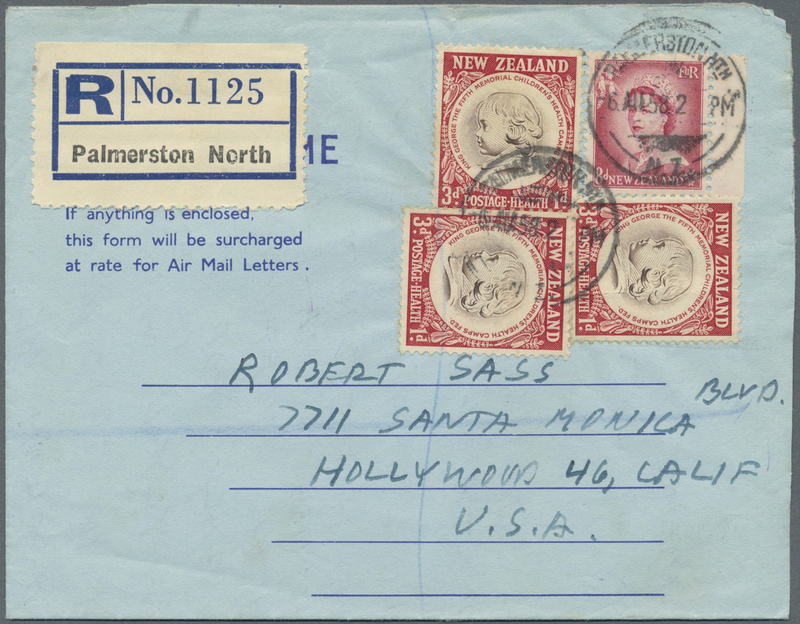 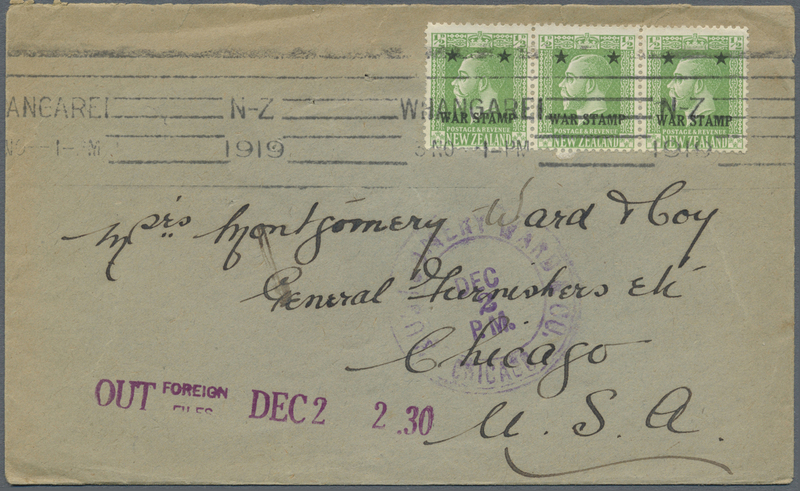 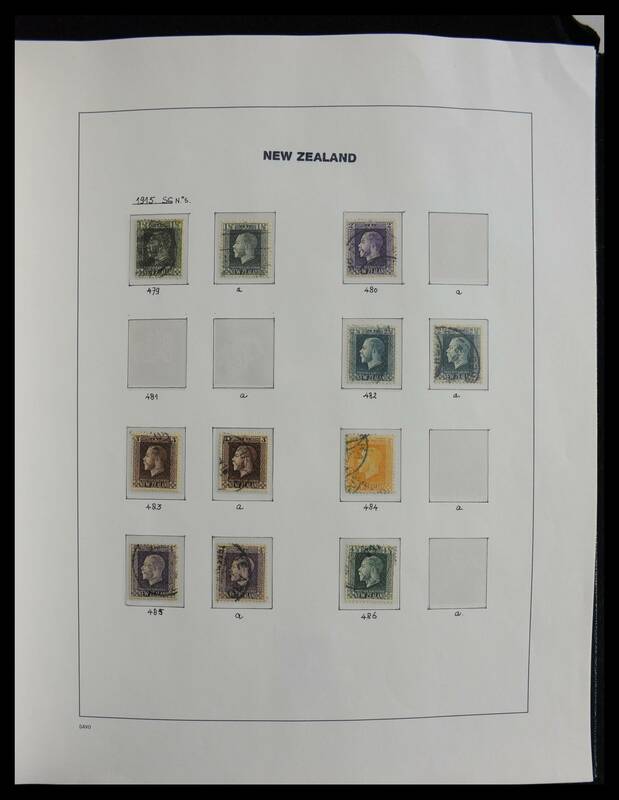 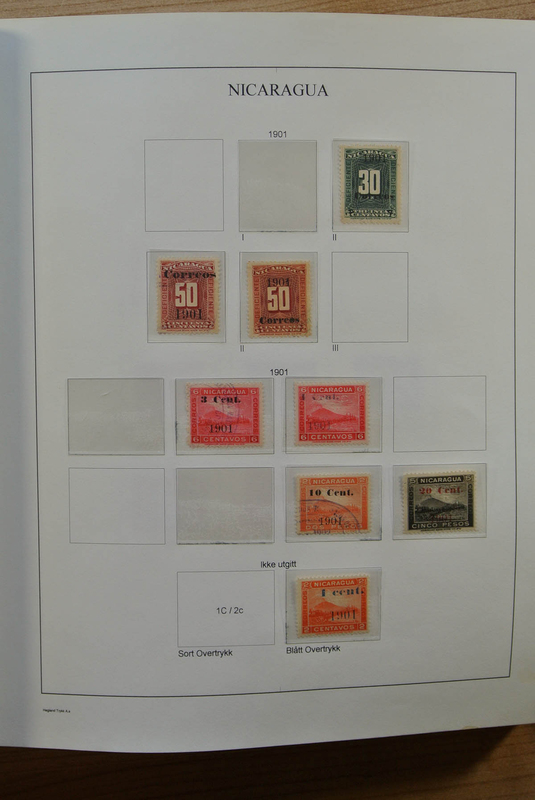 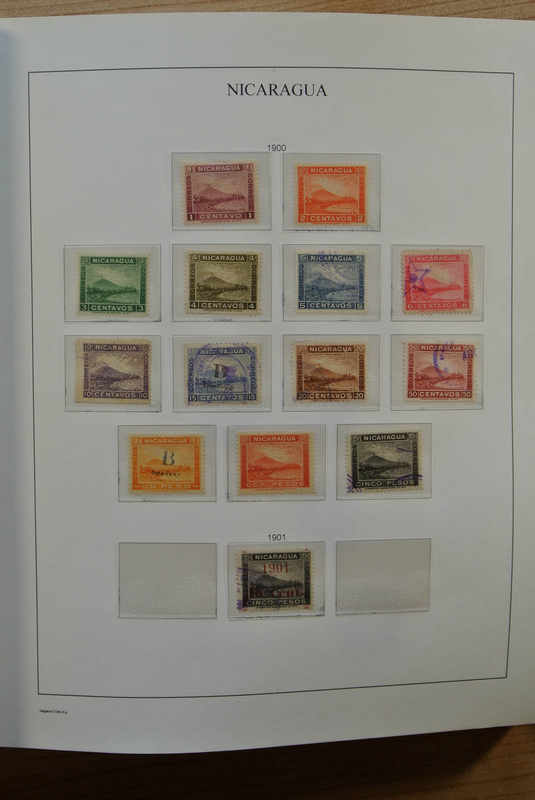 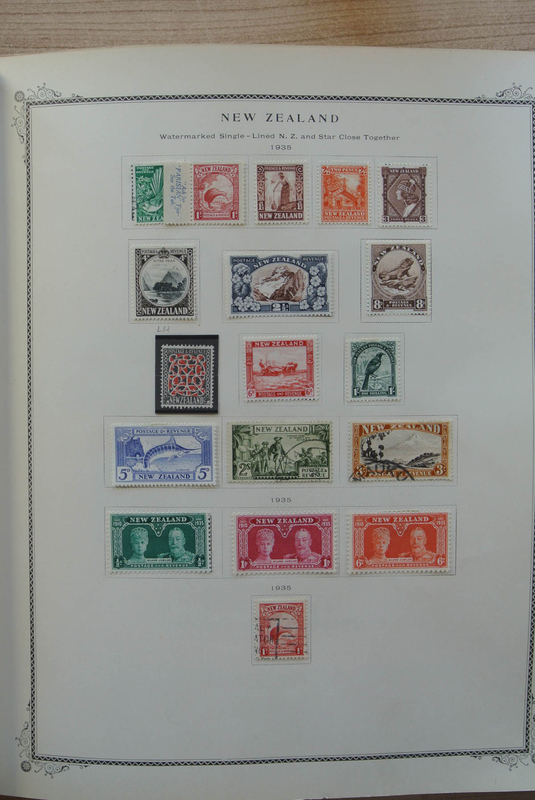 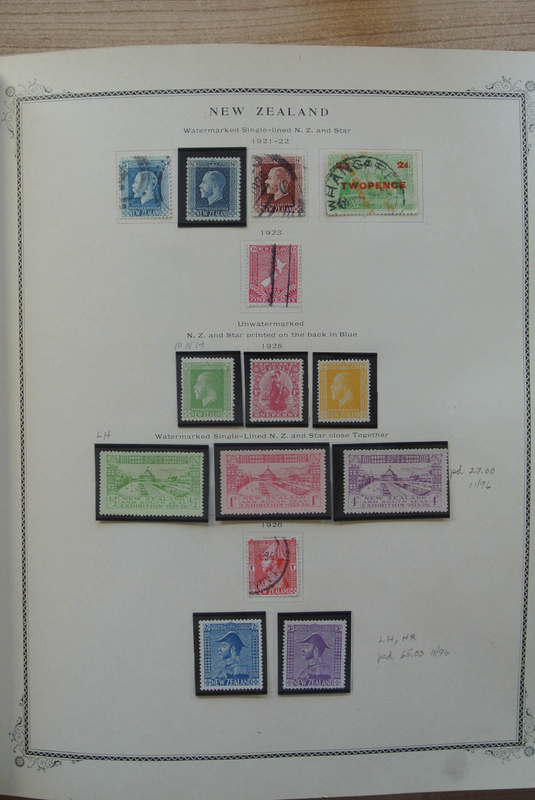 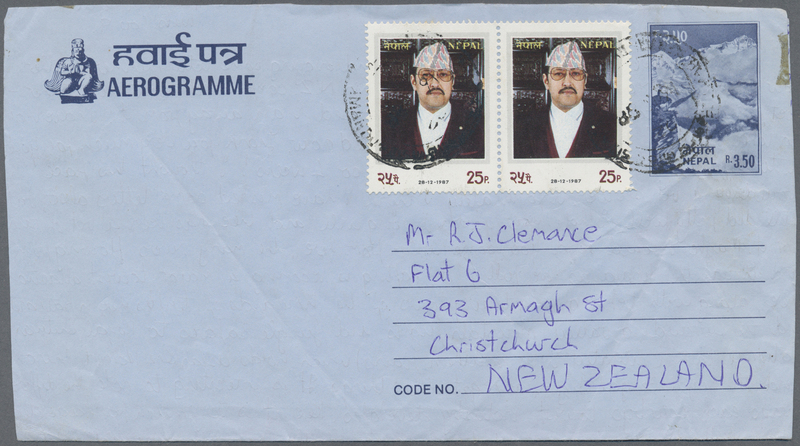 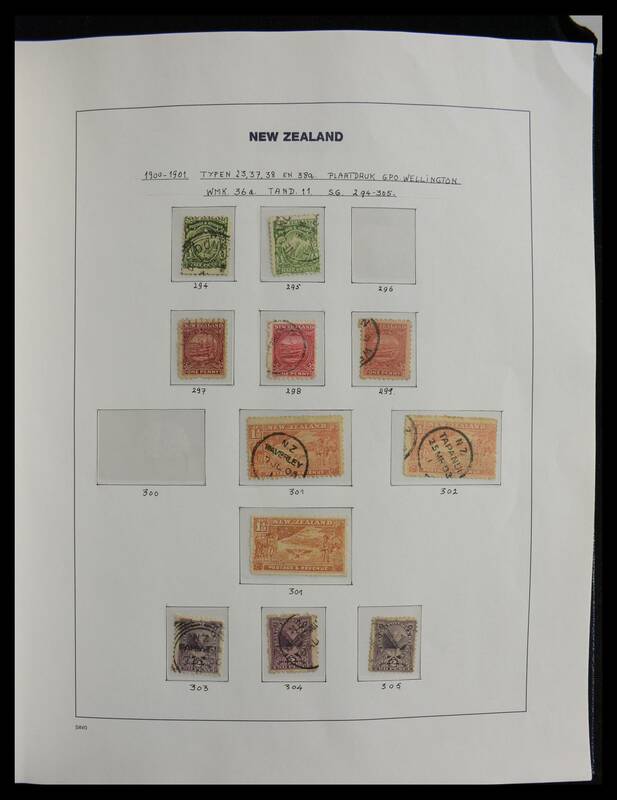 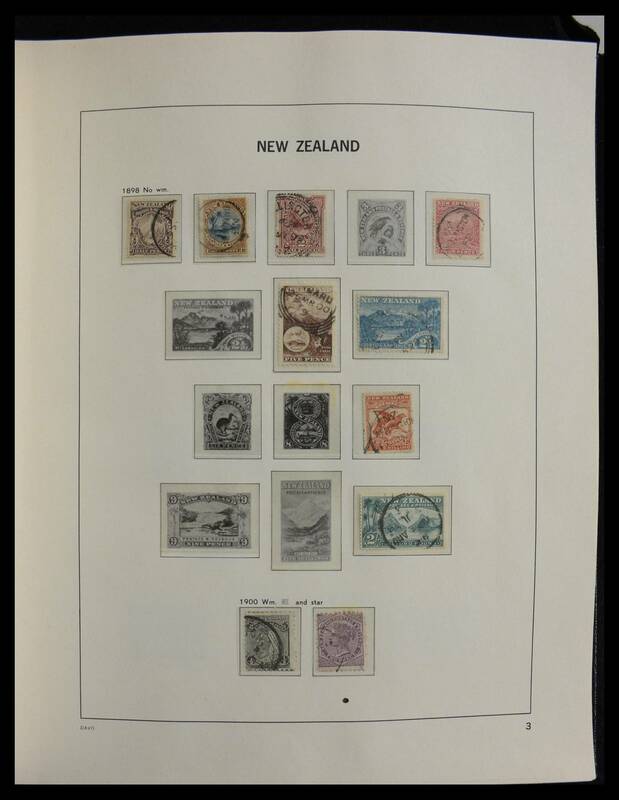 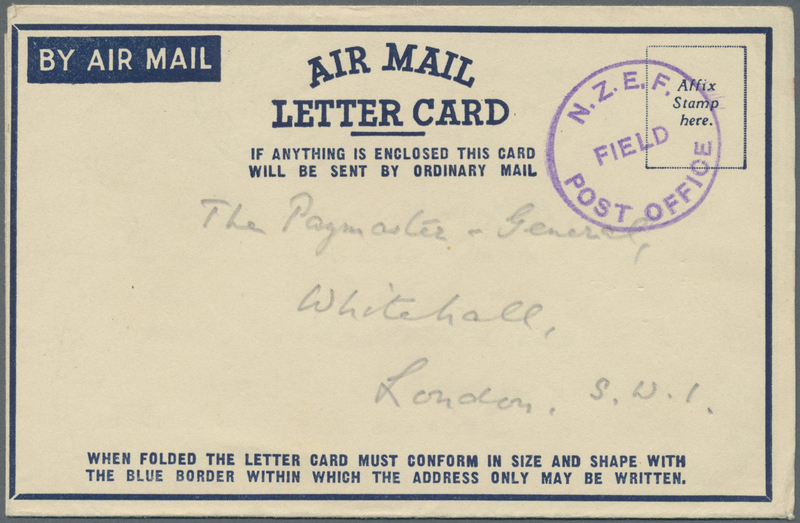 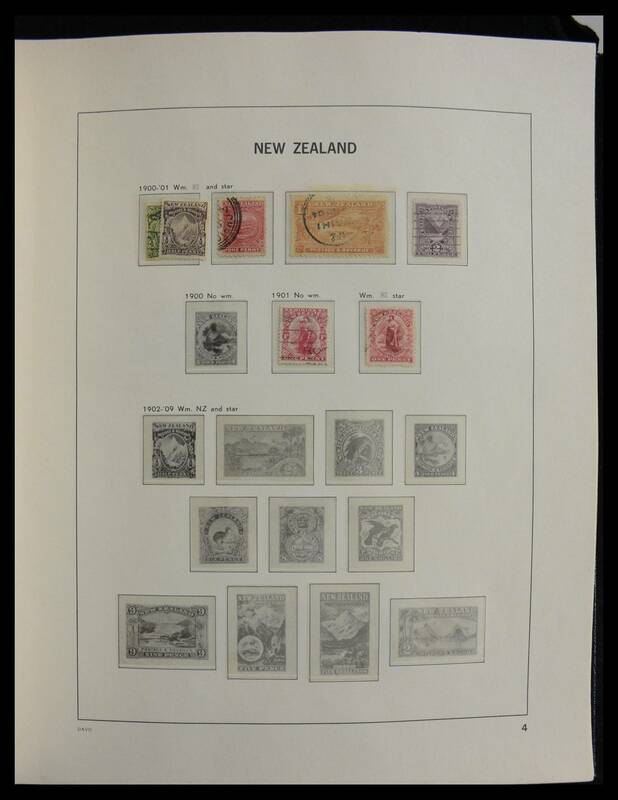 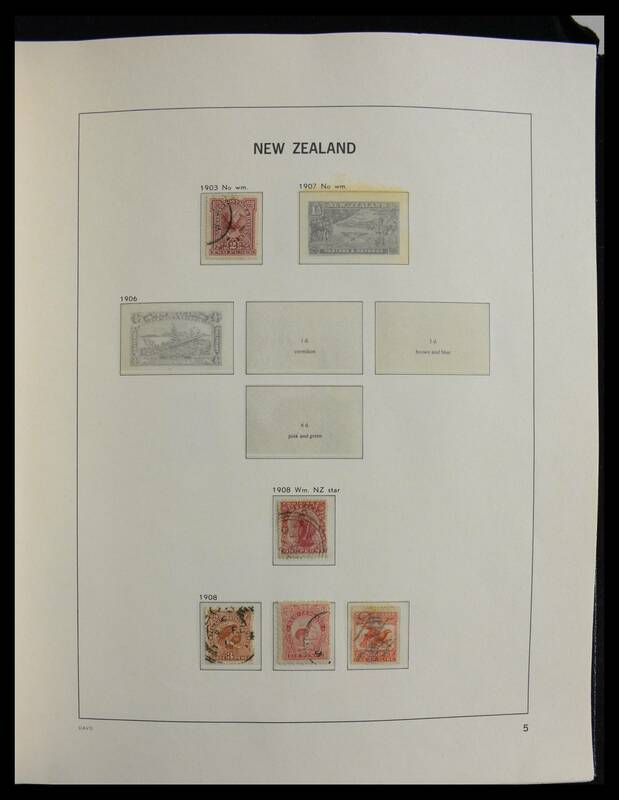 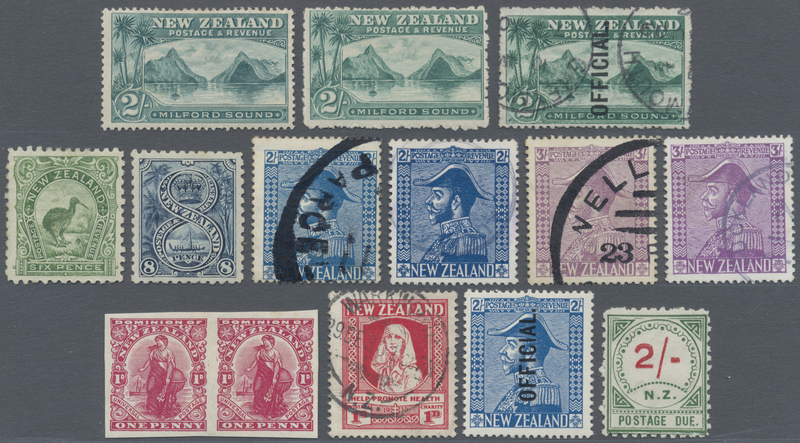 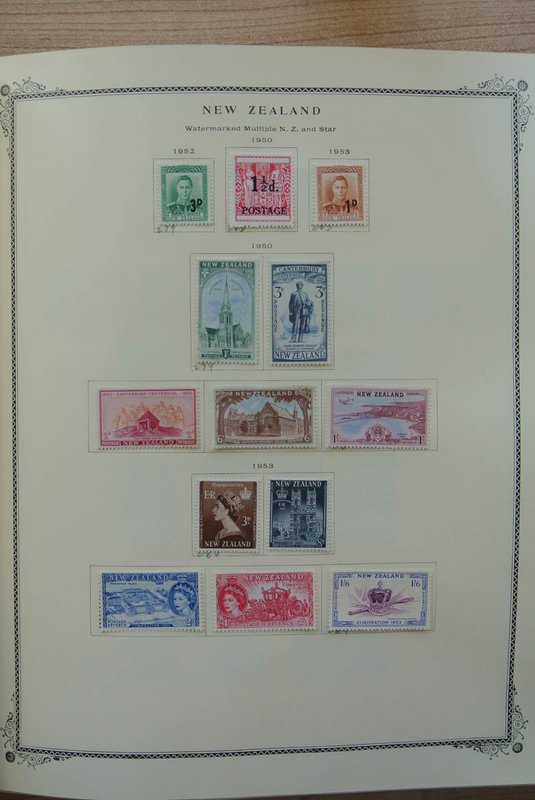 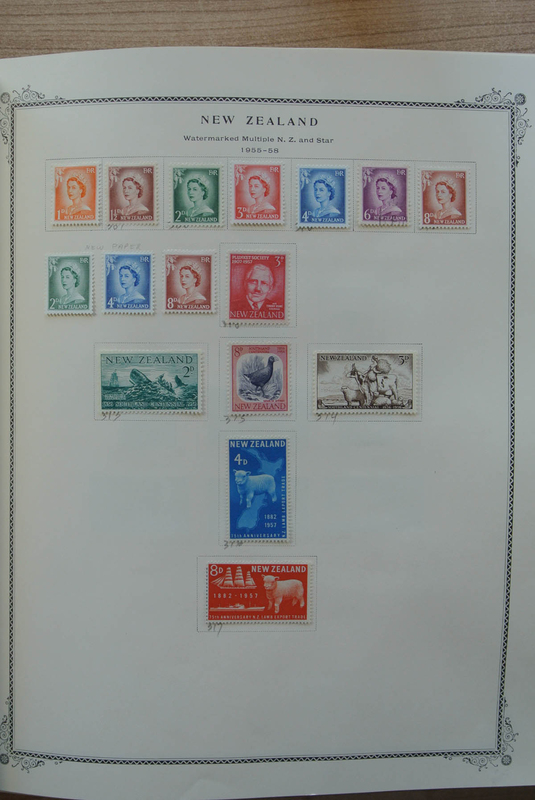 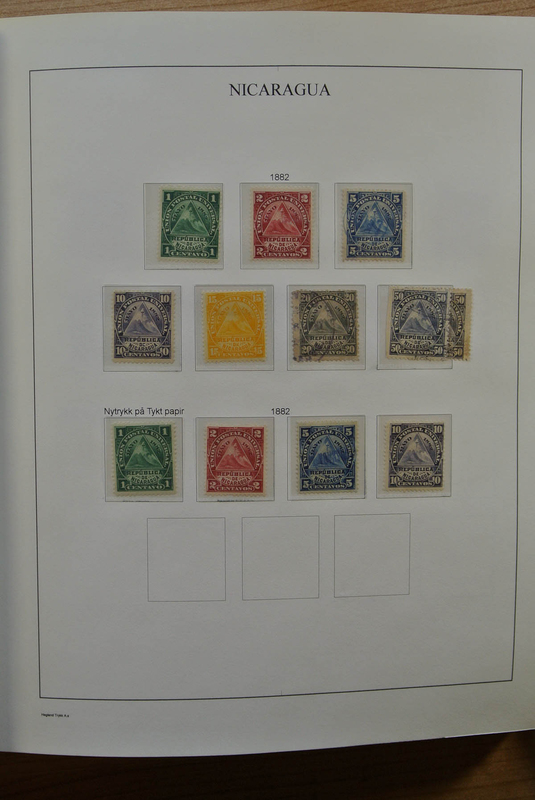 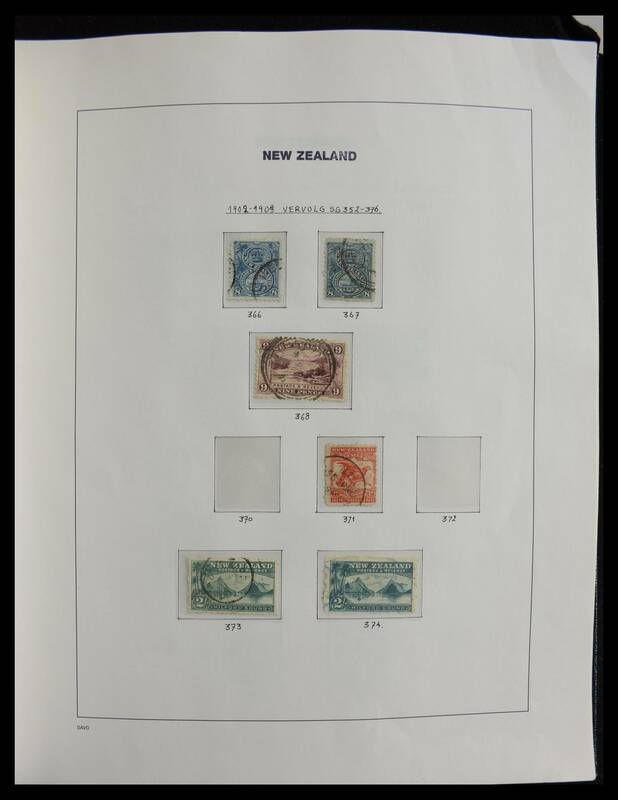 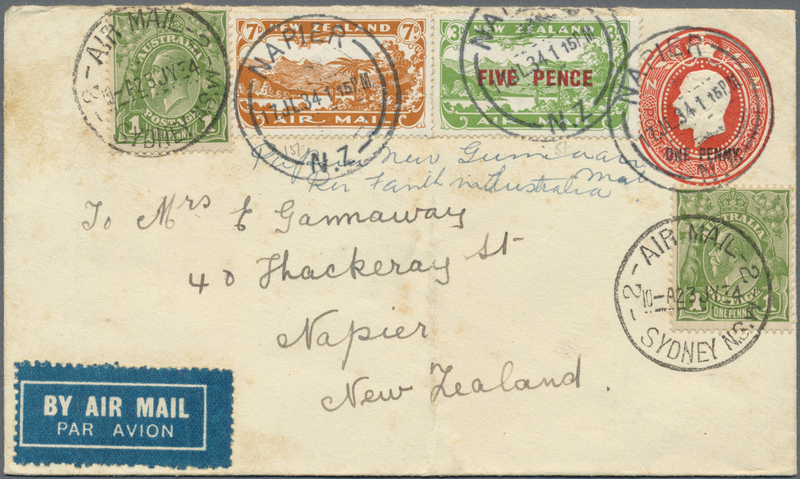 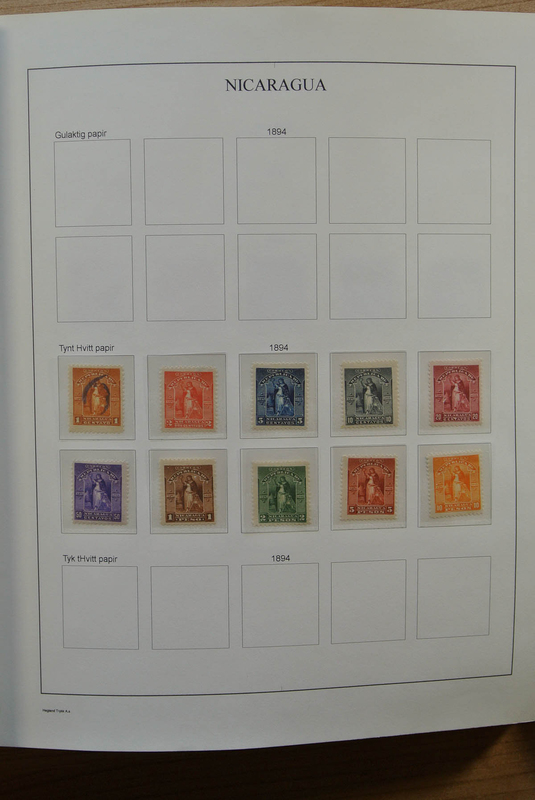 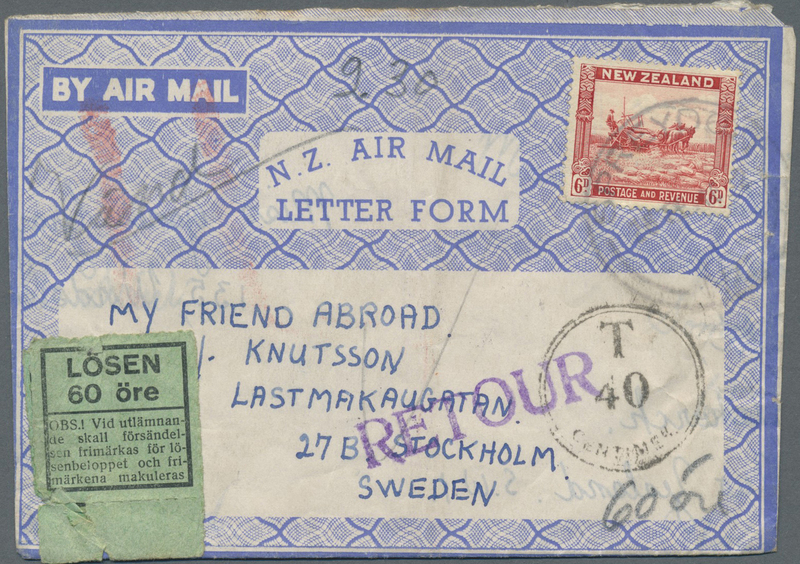 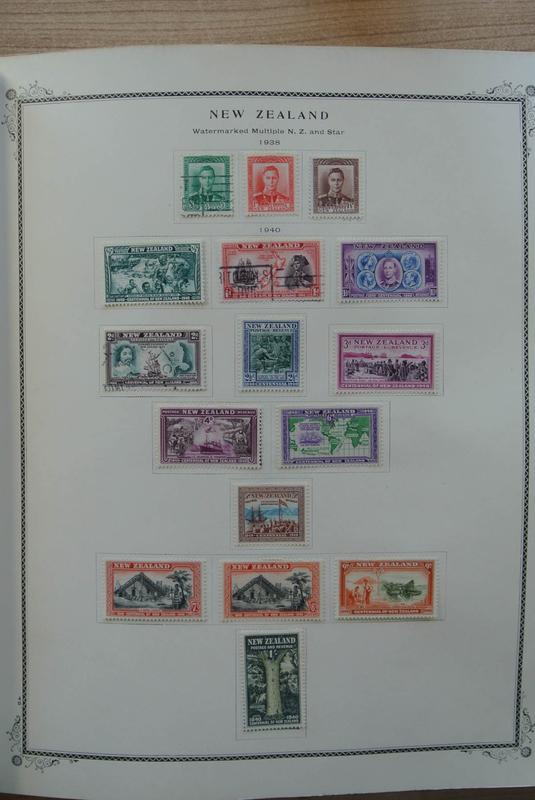 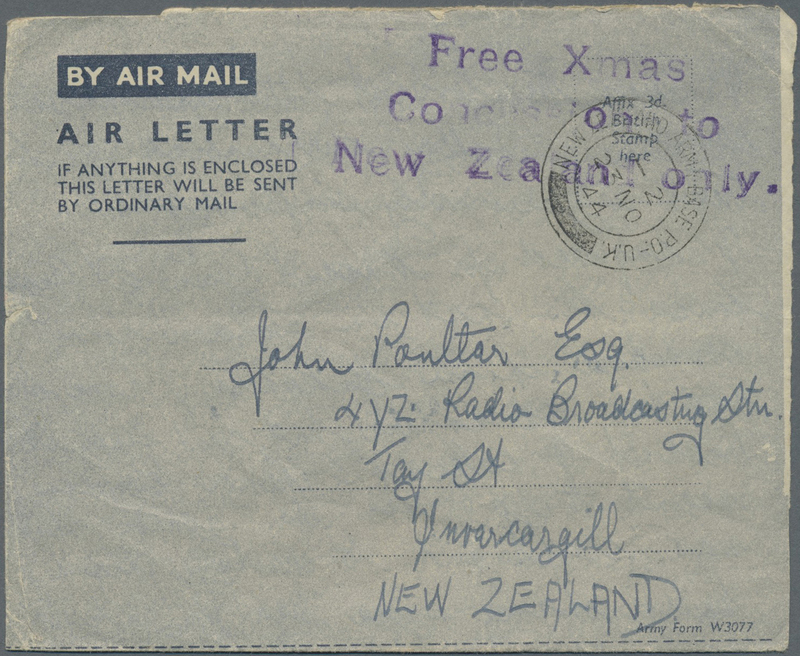 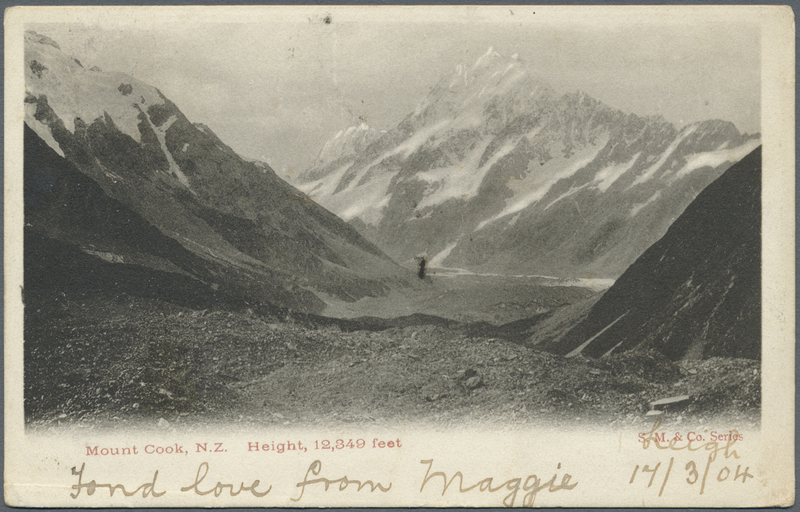 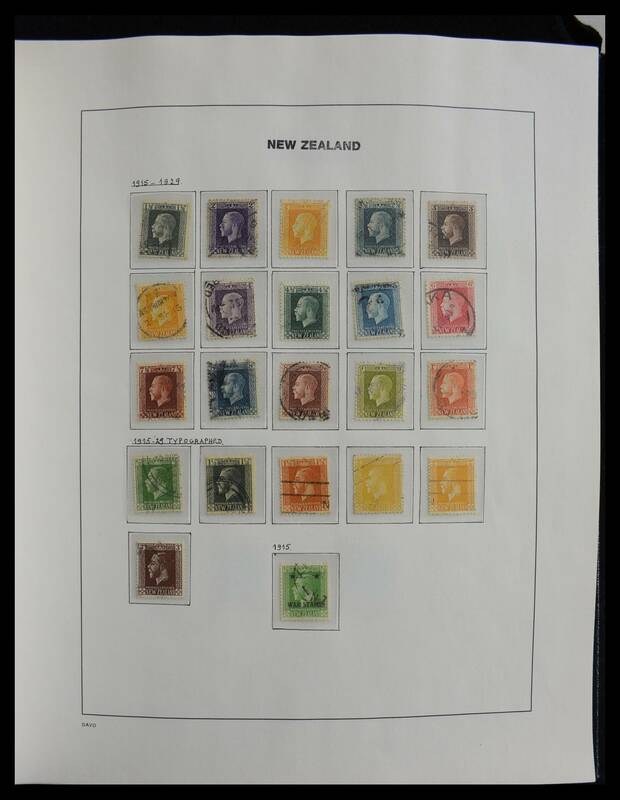 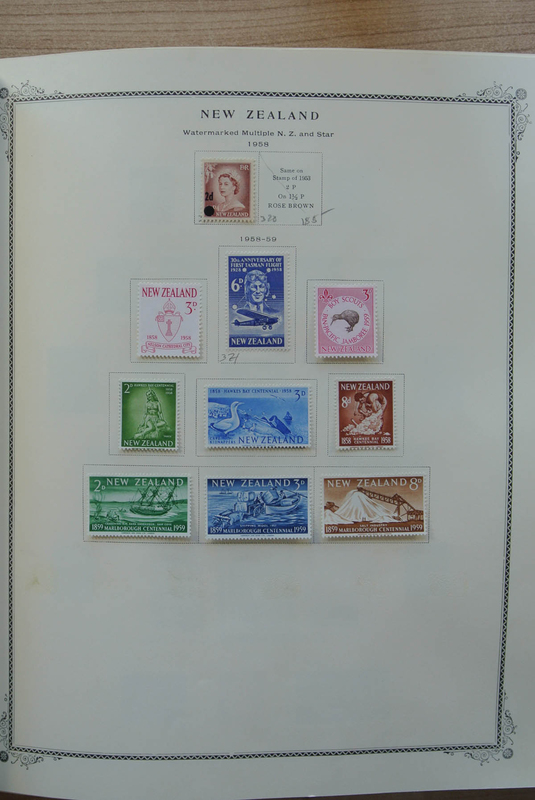 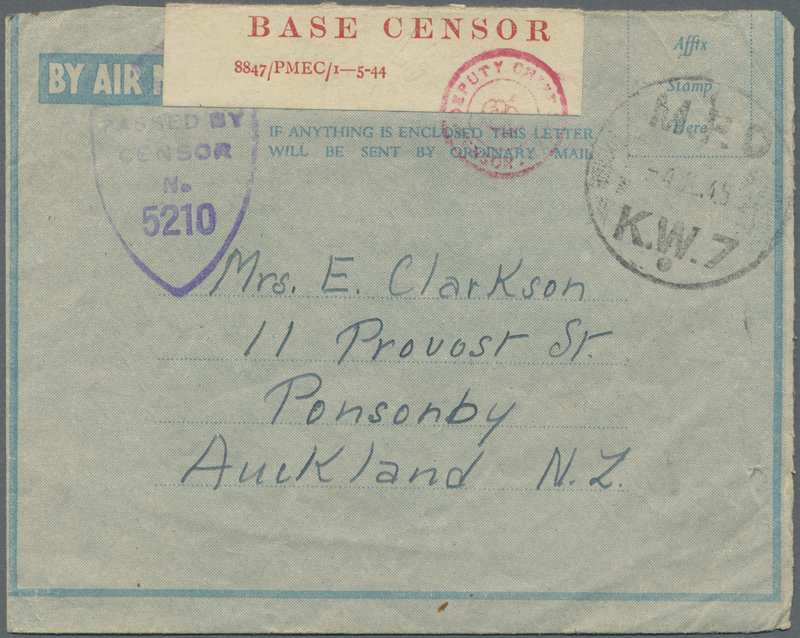 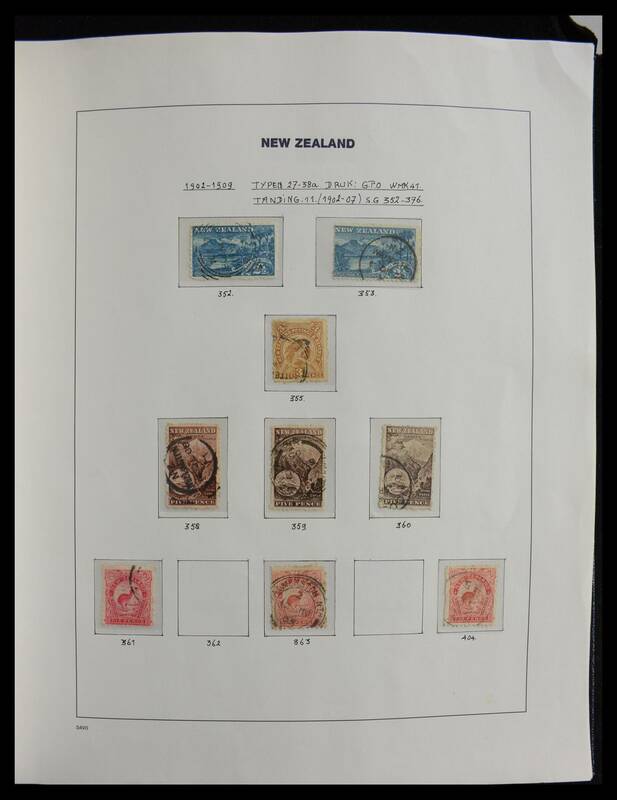 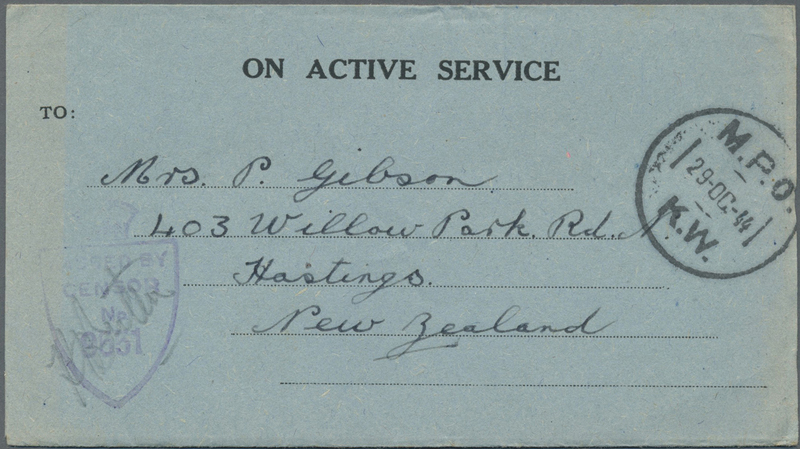 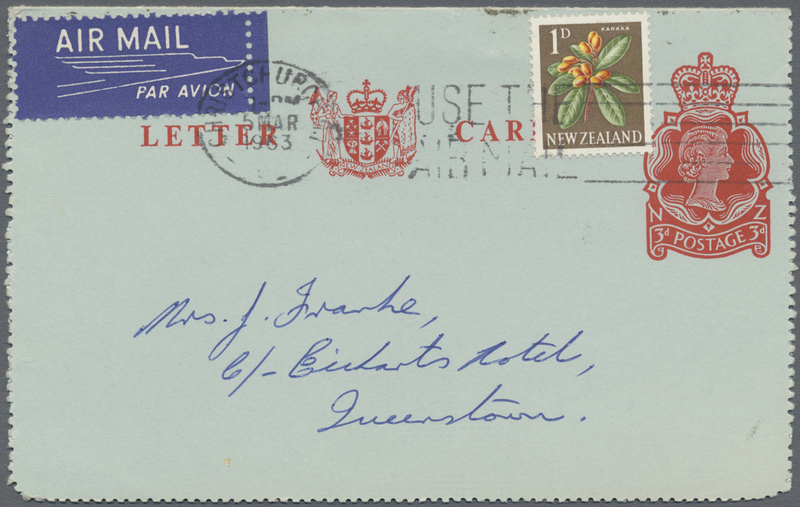 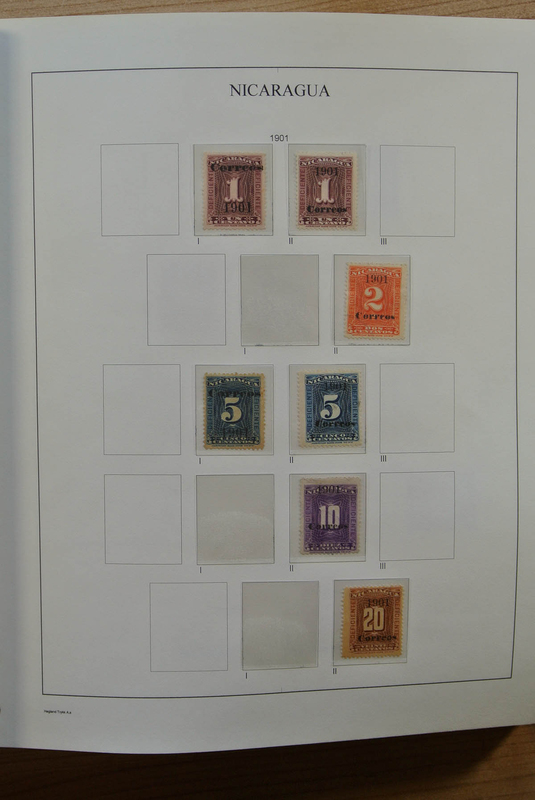 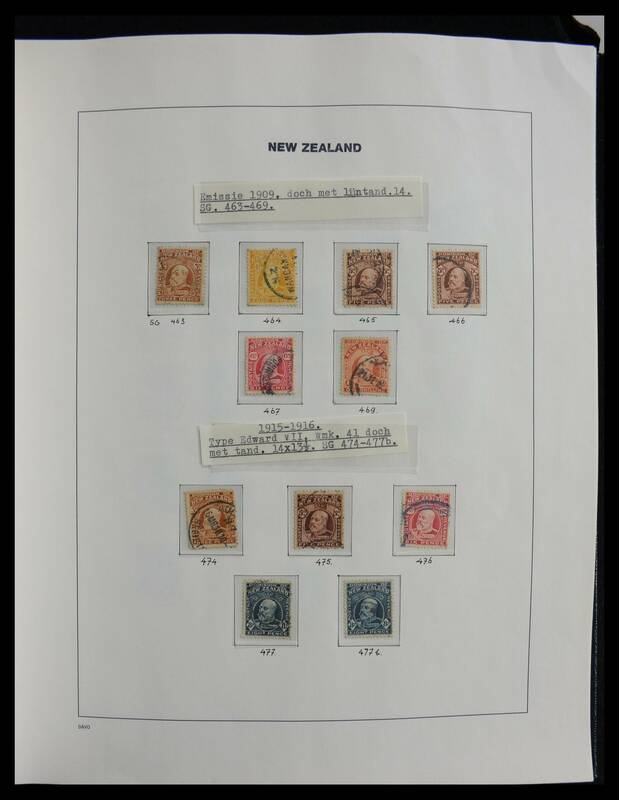 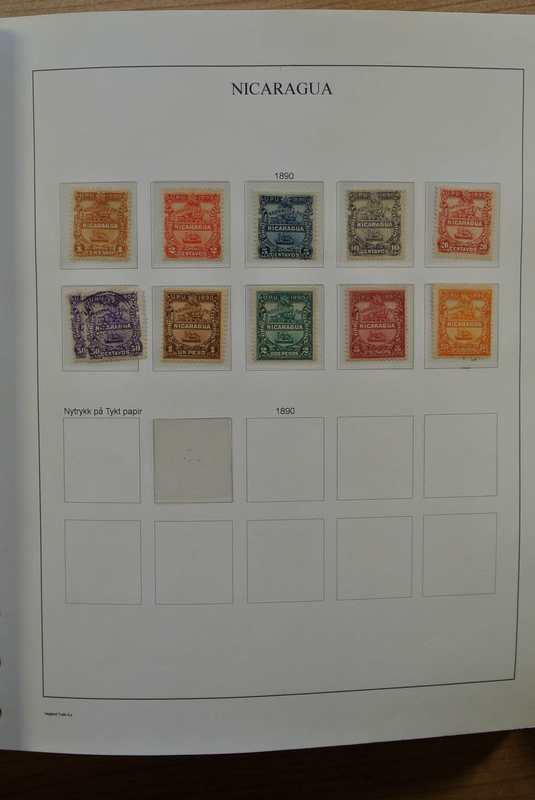 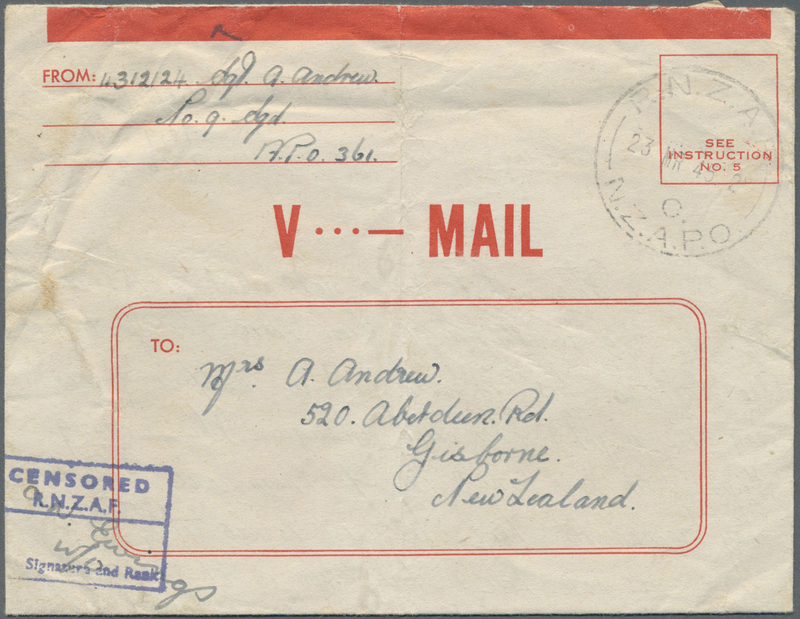 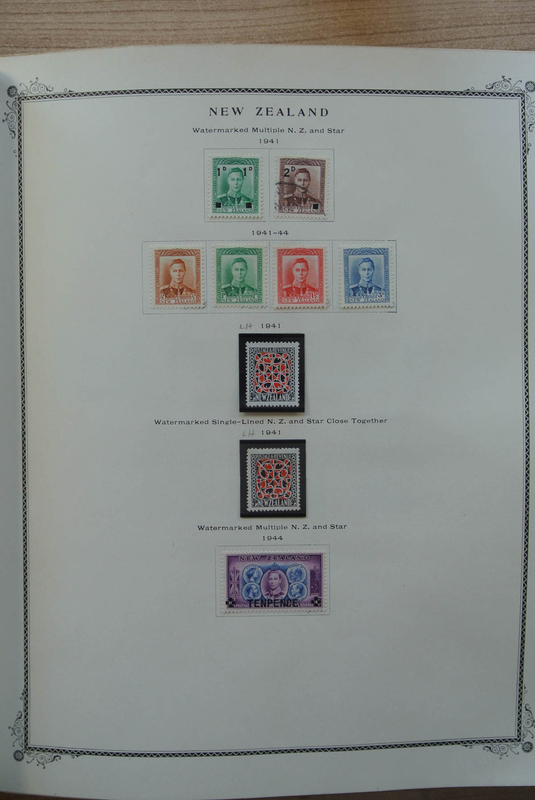 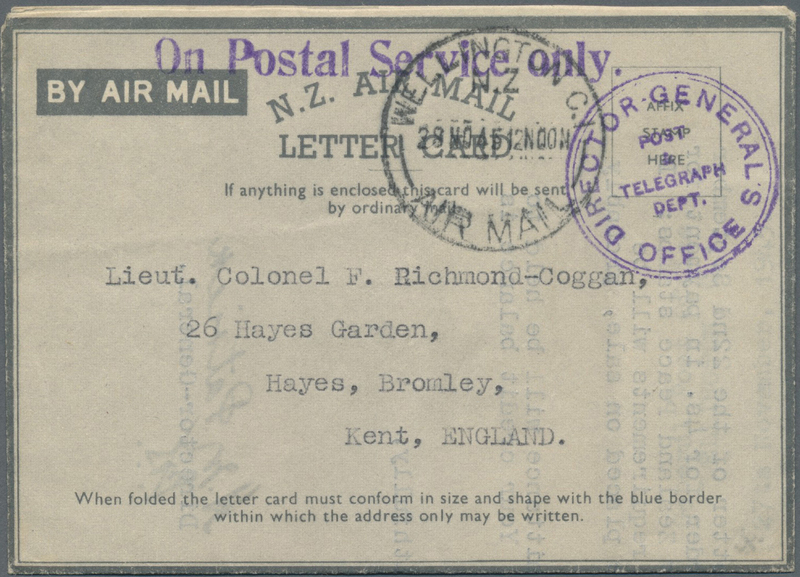 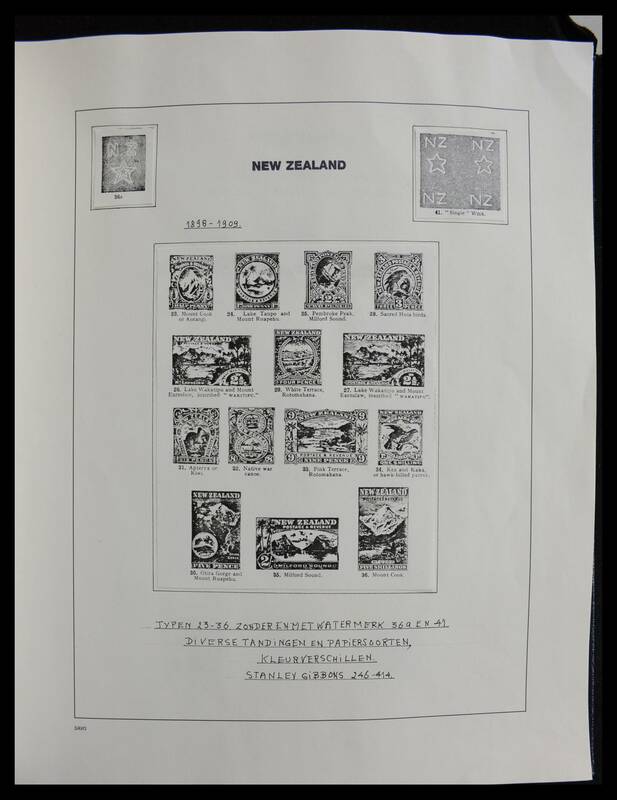 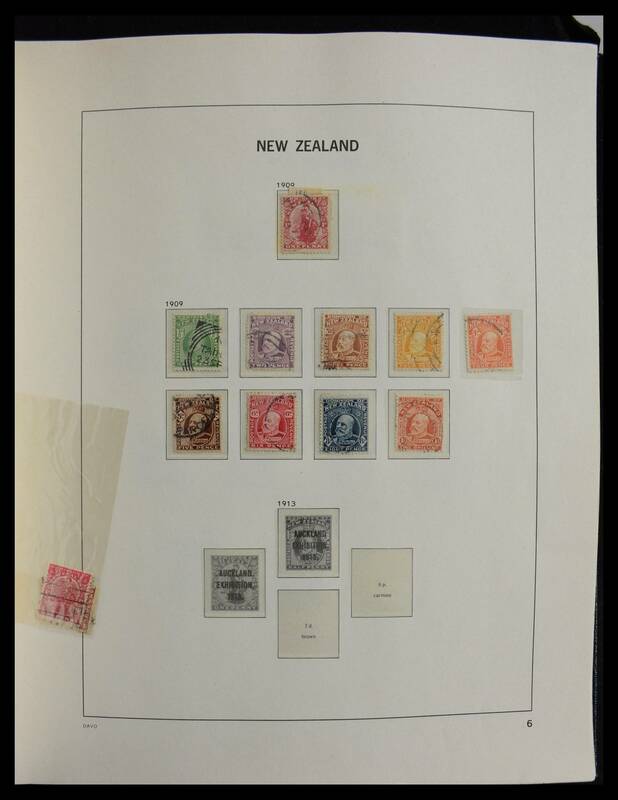 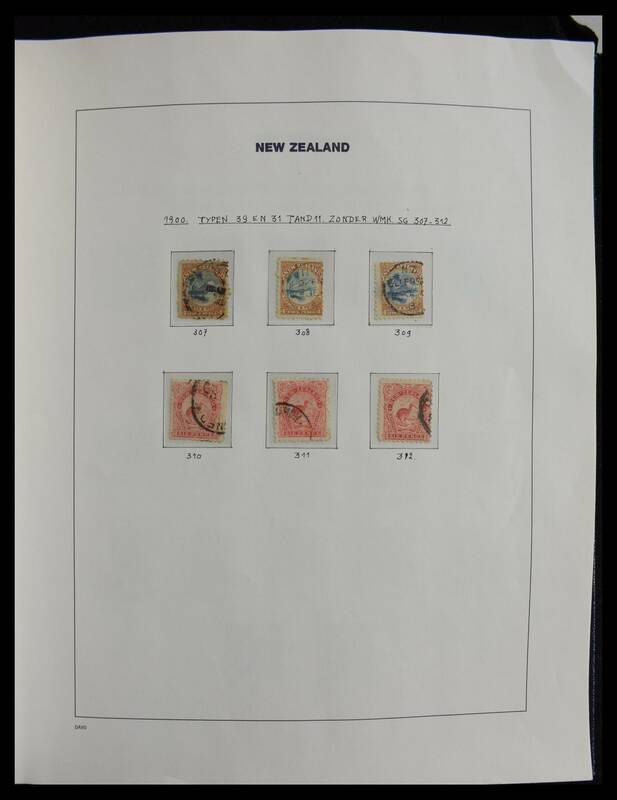 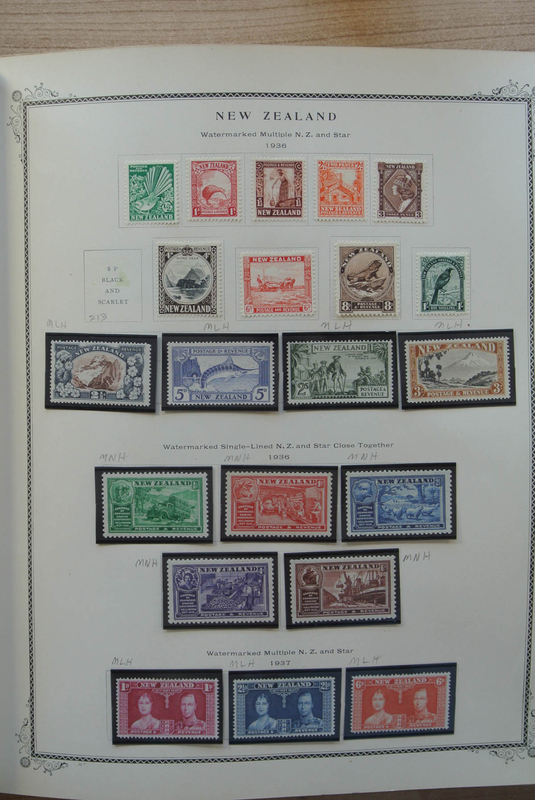 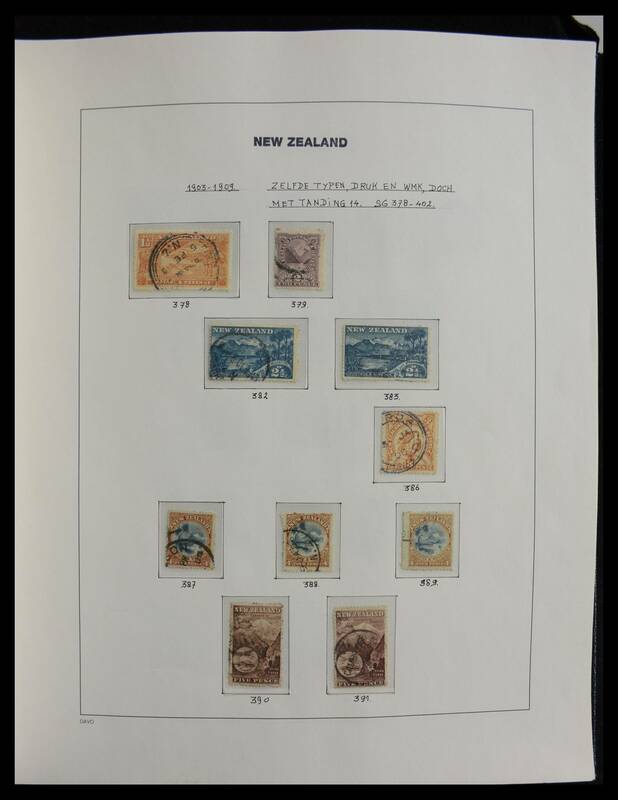 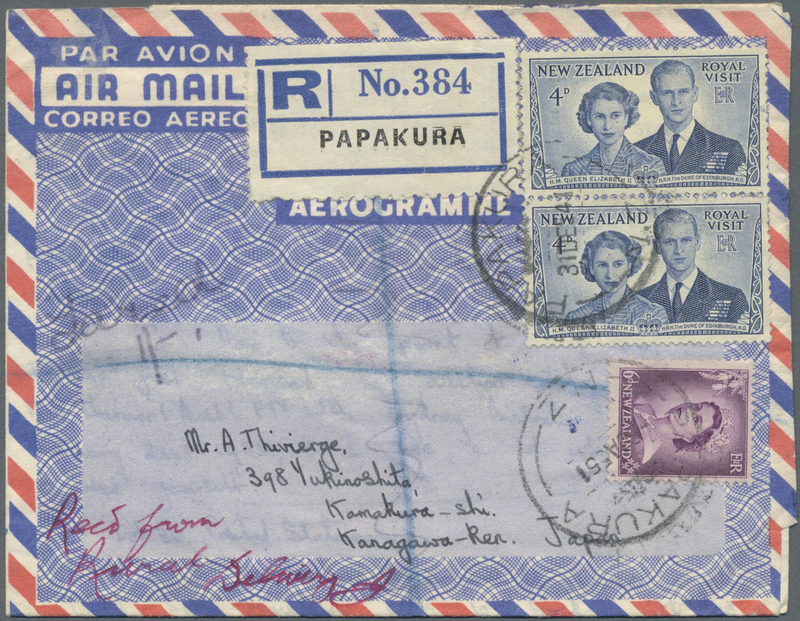 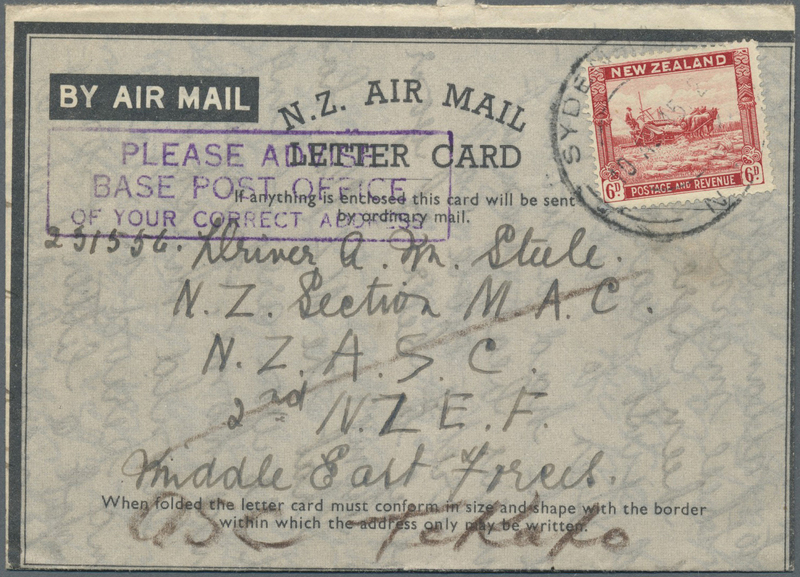 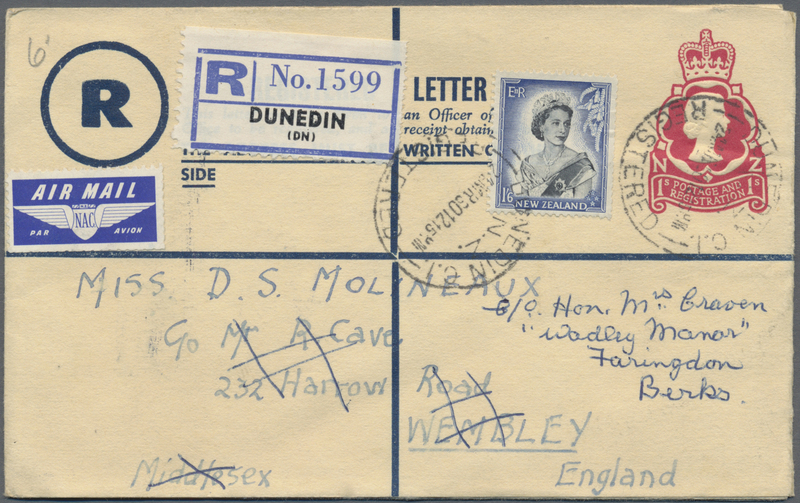 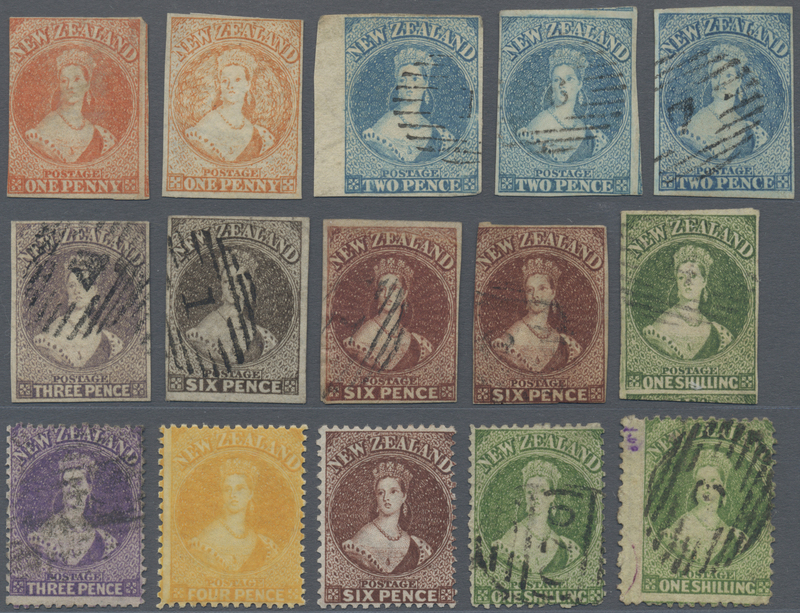 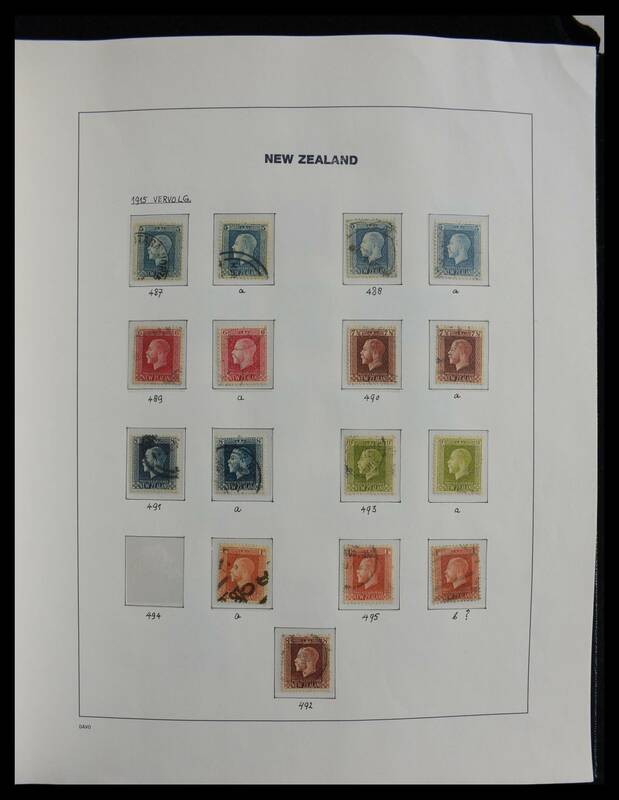 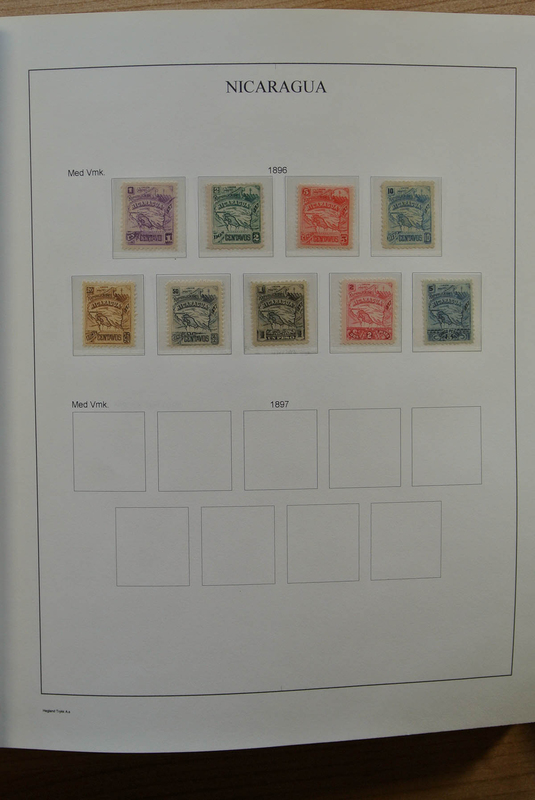 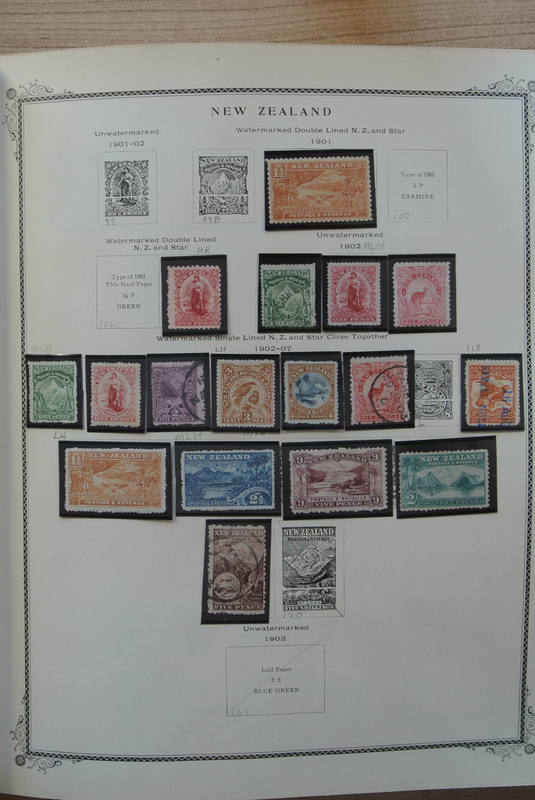 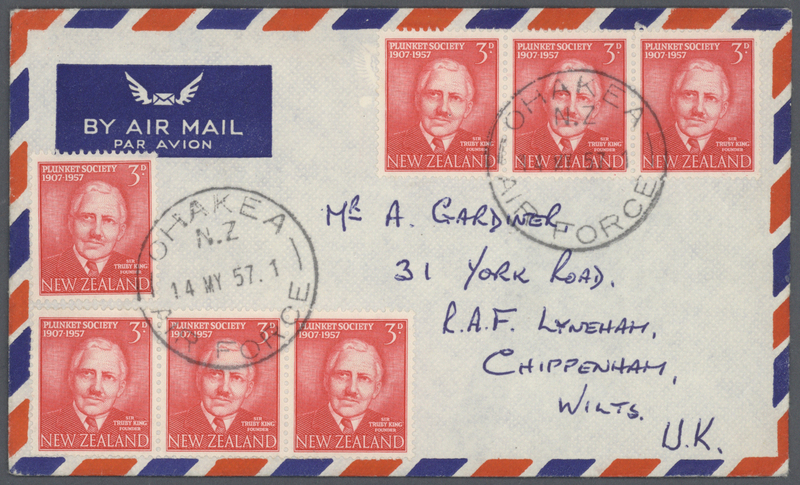 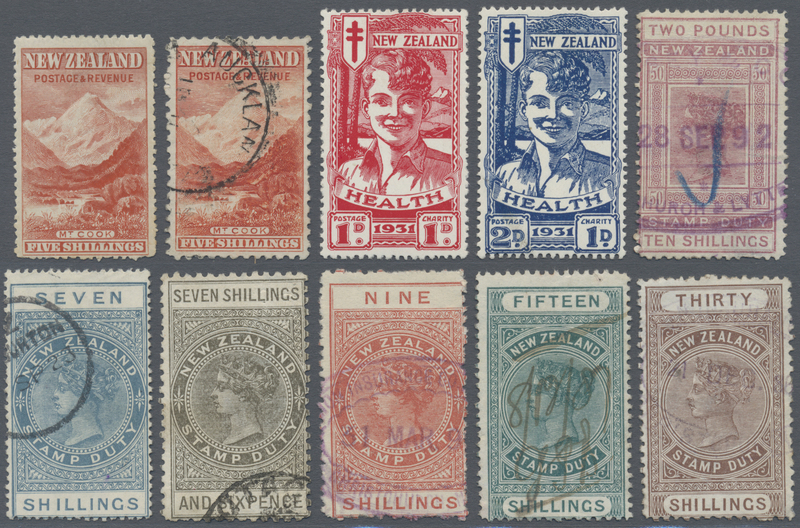 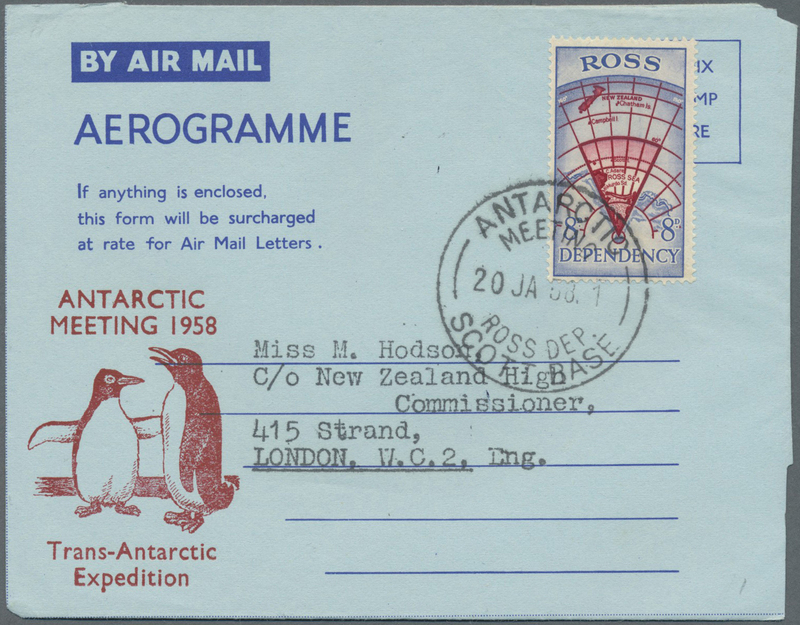 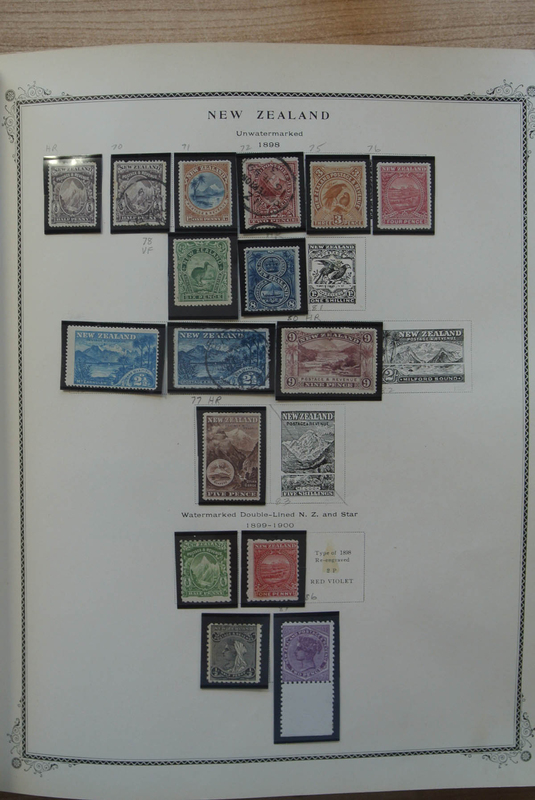 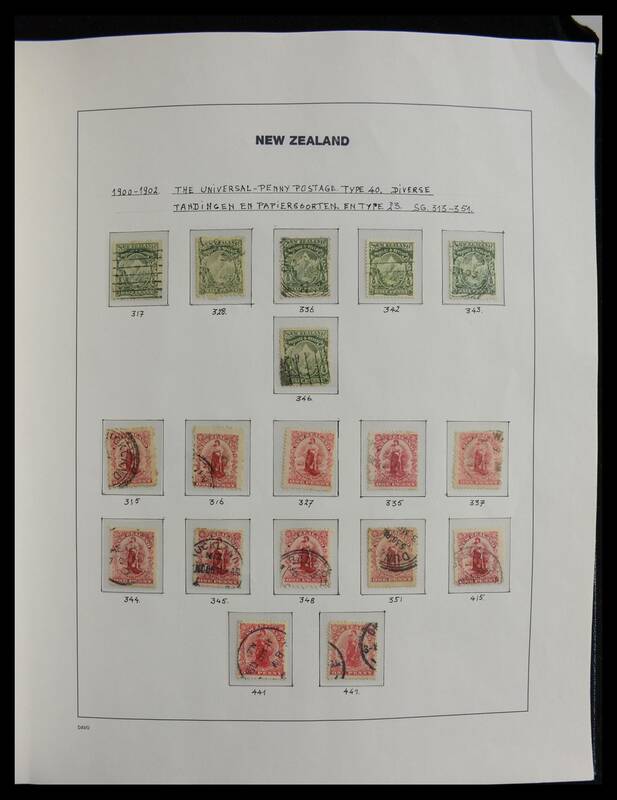 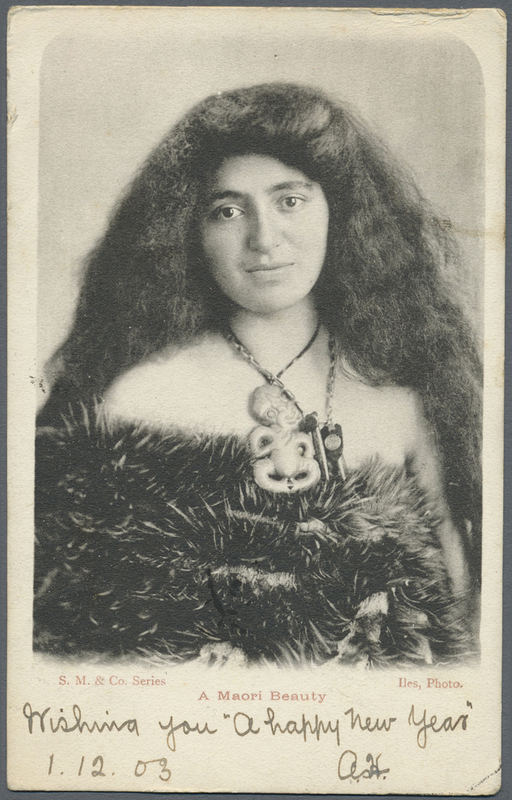 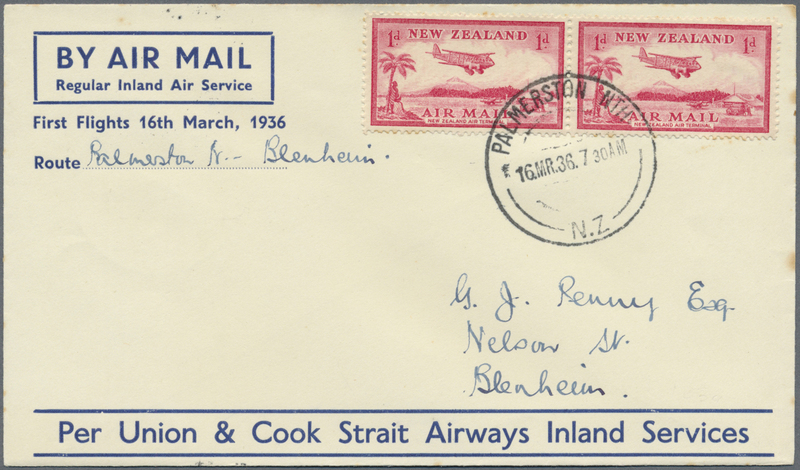 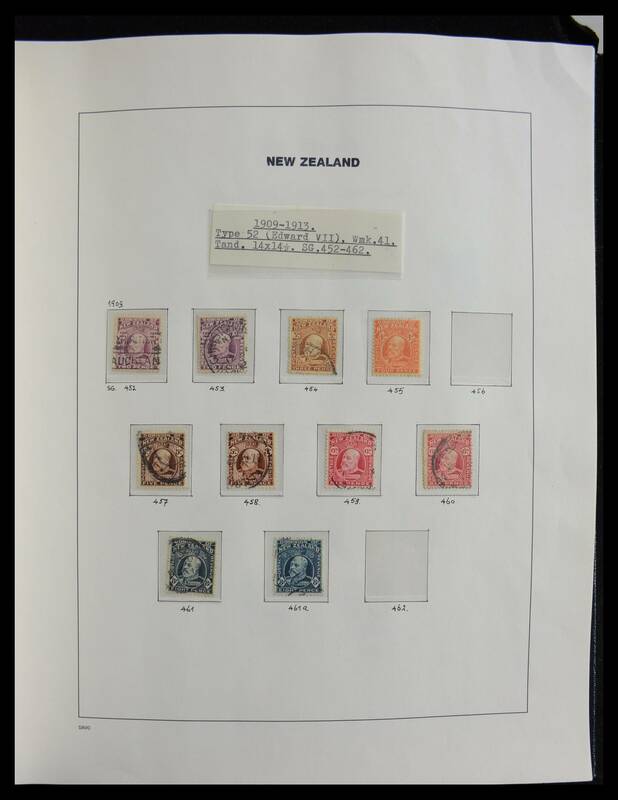 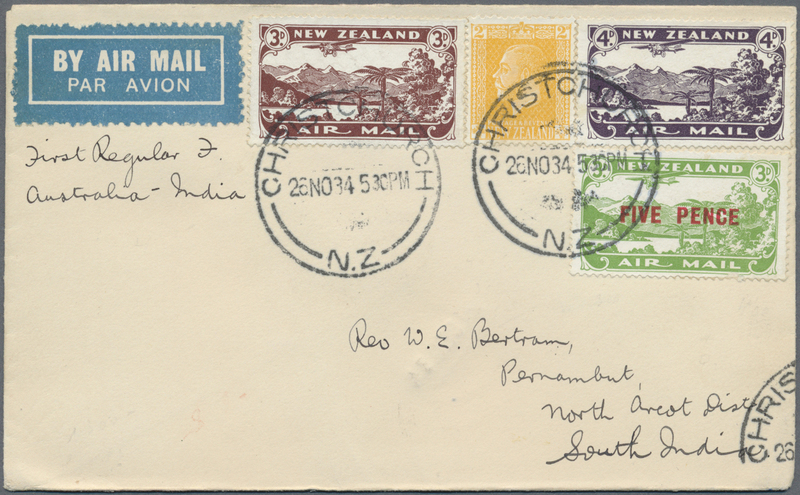 A rare opportunity to obtain choice material and for the New Zealand collector, with 1000's of stamps in two binders. 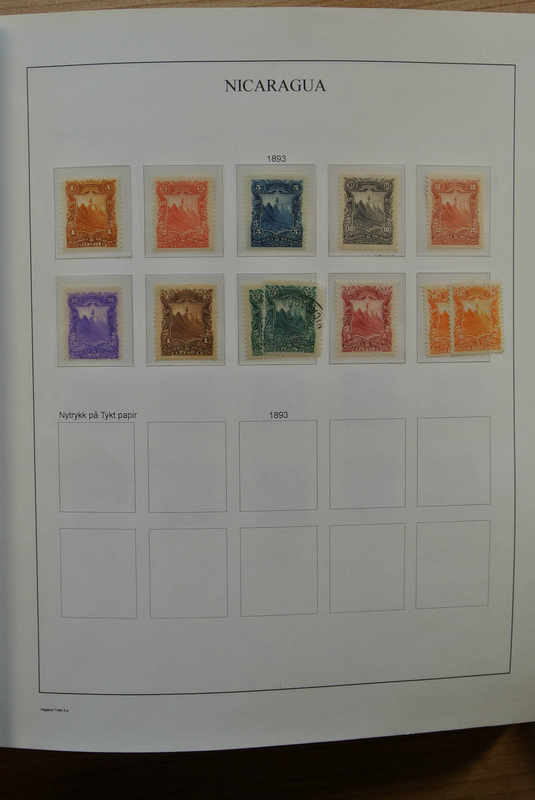 SG about £5000-6000.